Fond du Lac: P.B. Haber Printing Co., 1925. 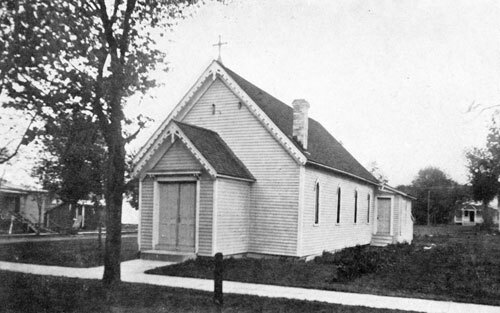 The first Church service in Ahnapee, the former name of Algoma, was held by Bishop Brown on Aug. 15, 1877, one person being confirmed, and an infant baptized. The Rev. Francis Moore was appointed missionary in charge and he remained until 1883. During his time (in 1879) a church was erected, the first mission church built in the diocese after its organization. This building, called Grace Church was entirely burned in the spring of 1884 while the Rev. C. D. Mack was in charge. From that year until 1891 there was no clergyman in residence, but the succeeding priests at Jacksonport, the Rev. W. R. Gardner, D. D., the Rev. E. R. Sweetland, and the Rev. Joseph Jameson drove here once a month and held services. In June, 1890, while the Rev. Fr. Jameson was in charge, Bishop Grafton made his first visitation and confirmed sixteen, services being held in the Masonic hall. The Bishop stirred up the people to rebuild their church, offering to help them, and work was begun. The next year, in June, 1891, the Bishop made his second visitation and consecrated the new church under the name of St. Agnes-by-the-Lake, and confirmed twenty-three persons prepared by Fr. Jameson. Mr. A. P. Curtiss, who was a student for the ministry at that time, accompanied the Bishop on his visit, and remained during the summer as lay Reader. On June 12, 1892. Mr. Curtiss was ordered Deacon and took charge and was ordained to the priesthood on November of the same year. Fr. Curtiss remained as priest-in-charge until March, 1896, and during his time the guild hall was built and the work developed. The Rev. H. W. Blackman was in charge from March to September, 1896, when the Rev. John Sword became Vicar, remaining for about a year. The Rev. W. R. Gardner, D. D., then took charge remaining until his death at Algoma on Nov. 25, 1906. The Rev. H. S. Dawson who had assisted Dr. Gardner during his last sickness remained on until Oct. 18th, 1907, and on All Saints' Day of that year the Rev. H. W. Blackman was appointed as Priest and has continued in residence since. The Rev. Alfred L. du Domaine, Waupaca, Priest in charge. Vicar. 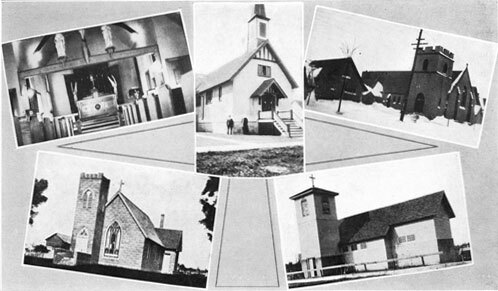 Mission organized in 1895. The Rev. H. L. Burleson of Waupaca appointed priest in charge. Senior Warden Mr. Isaac Simcox; Junior Warden, Mr. A. M. Nelson; Treasurer, Mr. Imri Turner; Secretary, Mr. Chr. A. Hauff. Prominent laymen were Mr. A. J. Smith, Mr. Isaac Simcox, Mr. Imri Turner, Mr. A. M. Nelson, Mr. Chr. A. Hauff, Mr. A. C. Gasman. Services were held first in rented hall. In 1905 the present mission church was built by a hard working people devoted to God and His Church. Lots had been paid for by the St. Olaf's guild. Only an indebtedness remained on the whole property of $400.00. In 1913 this was paid and the church was consecrated by the Bishop and many furnishings put in. It is a very attractive little church. It has always been under the care of the Rector of Waupaca except for a short period when it was under the Rector of Stevens Point. There is a Sunday School maintained. The Rector of Waupaca goes over every week for Evening Prayer on Sunday evenings and the first Sunday of the month for an early Celebration of the Holy Communion. Other Celebrations on Monday mornings. Population of Amherst 575. Farming community. No factories. Potato industry mostly. Communicants thirty-eight. Sunday School twenty-two. Mrs. E. T. Johnson, superintendent. S. N. Peterson, Senior Warden; Bartel Johnson, Junior Warden; Mrs. John Keener, Treasurer. Small devoted band of people. Faithful in their attendance. 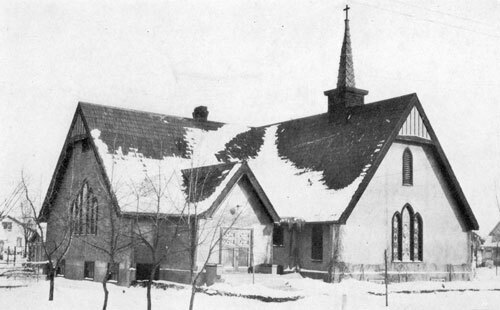 Our first service in Antigo was held in November, 1883, when the Rev. Walter R. Gardner was called from Fond du Lac to baptize Bessie and Euphemia, infant daughters of Mr. and Mrs. J. C. Lewis and Mr. and Mrs. G. W. Hill. The service was held in what is now St. Hyacinth's Roman Church, which then belonged to the Methodists. Nothing further was done until the fall of 1885, when the Rev. Joseph Jameson, then a layman, spent a few days in An-tigo. He held a service in a hall on Christmas Day. On Sunday, January 3, 1886, the Rt. Rev. J. H. H. Brown, first Bishop of Fond du Lac, visited Antigo and formally organized a mission, to be known as St. Joseph's. He appointed Messrs. Lloyd Breck and M. M. Ross as Wardens, J. C. Lewis as Treasurer and F. A. Forbes as Secretary. Services were held on the last Sunday in each month in Odd Fellows' Hall. In April of 1886 Rev. Fr. Jameson, who had just been ordained Deacon, came into residence and began to hold services every Sunday. Although he remained only until October of 1887 his work was fruitful. About forty children were baptized, a lot was bought on the east side of Milton street south of Sixth Avenue, and a frame church built at the cost of about $800. The building has since been moved twice and is now in use as a parish hall. There was no Vicar from the fall of 1887 until the arrival of the Rev. Alfred Wilson Griffin in July, 1890. He remained six months, during which time he reorganized St. Catherine's guild--which has been working faithfully ever since. From 1890 to 1899 Mrs. Deane maintained the Sunday School and also gathered the people together during Lent and read prayers. Her record of devoted service in the face of discouragement will long be remembered. In 1907 the new stone church and vicarage was built under Rev. W. Fred Allen and the dedication changed from St. Joseph to St. Ambrose. Rev. Fr. Allen was followed by Rev. A. F. S. Peck, Rev. R. Johnston Campbell, Rev. A. W. Griffin a second time, Rev. Cuthbert F. Hinton, Rev. J. J. Crawford, Rev. Leroy A. Jahn and on Oct. 18, 1923, Rev. Franklin C. St. Clair became Vicar. The Rt. Rev. Jackson Kemper held the first service of our Church in Appleton in 1854 or 1855. The Rev. C. C. Edmunds organized the parish in the autumn of 1856 in a building opposite the Congregational church. The vestry was composed of Edwin Atkinson, Wm. L. Malone, wardens, and Dr. William S. Ryan, W. H. Lamphen, L. L. Randall, T. G. Reed, R. P. Eaton, vestrymen. The first Baptism was that of Rufus P. Eaton, in 1857. The first Confirmation class, Oct. 27, 1857, Rufus P. Eaton, Marion E. Bailey, Lizzie Malone, by Bishop Kemper. The first Eucharist was celebrated during this year, two persons only receiving the Blessed Sacrament. The Rev. Simeon Palmer was the first regular missionary, his services being divided between this parish and Menasha, where he resided. He entered upon his work in 1862 and died Oct. 23,1864. The Rev. L. P. Tchiffely took up the work for a few months and was succeeded in June, 1865, by the Rev. George Gibson, under whom the first Church building was erected at a cost of nearly $6,000.00, and about completed by Easter of the following year. March 1, 1868, the Rev. Jerome A. Davenport became rector and was followed by Rev. Edwin Peake, in 1869, and Rev. J. L. Steele, in 1871. The Rev. Geo. Vernor was called to be rector on May 5, 1872, and served for fourteen years. One hundred and sixty-one were baptised and ninety-seven confirmed during his rectorship. The Rev. James B. Williams became rector in the summer of 1886. Under the Rev. Geo. H. S. Somerville, who took charge June 19, 1889, a vested choir was introduced. The rectory was commenced in November of this year, and a guild hall built next to the church in time for Christmas. Father Somerville was succeeded in 1892 by Rev. Lloyd E. Johnston, and then in the spring of 1893 by the Rev. A. K. Glover. Rev. Dr. Dafter's rectorship of nearly seven years began in September, 1895. He left the parish in excellent financial condition, a mortgage of $2,500.00 having been paid off at Easter, 1901, and a sum of $500.00 remained for repairs and improvements. The Rev. Selden P. Delaney entered upon his work as rector in July, 1902. Under him the new church was built at a cost of $25,000.00. It is one of the handsomest Church edifices in the diocese, and a marked feature of the city. The Rev. Orrok Colloque succeeded in May, 1908, and was followed by the Rev. Irving Spencer, Dec. 15, 1910. During this year a roomy guild room was built and equipped in the basement of the church, a choir room constructed and fitted with fifty lockers, and a vested choir of forty-five voices introduced (1911). The Rev. Doane Upjohn became rector in 1912, and was succeeded early in 1921 by the Rev. Paul O. Keicher, and he in turn was succeeded by the Rev. C. A. Wilson who assumed charge of the parish Oct. 15, 1924. Troup of Boy Scouts connected with church, no other community work at present. Manufacturing city, large paper mills located here and in the vicinity. Population 19,000. City has enjoyed a steady growth. Lawrence College located here, 1300 students, of which forty-five are members of our church. 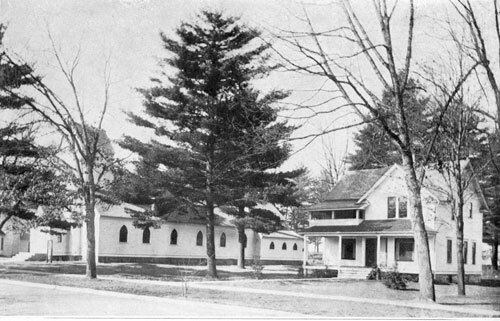 St. Andrew's Mission, Ashland, Wisconsin, was opened with appropriate services by the Rt. Rev. J. H. Hobart Brown, S. T. D., on St. Andrew's Day, Nov. 30, 1879 with twelve families and forty souls included. Various causes combined to check the work of the Church in the new lumbering district around Ashland. In 1883 the Rev. Jerome A. Davenport, Missionary on the Wisconsin Central R. R., was Priest in charge. Mr. John McCloud and Dr. F. H. Luce were the wardens. Services were held in the Business Men's Association rooms. Mr. Newell D. Stanley, a theological student, occasionally read the service. In November, 1883, the Rev. Howard B. St. George became Missionary in charge. Unable to find suitable living quarters he resided in Bayfield coming to Ashland by boat for week end services. On November 1, 1885 he was transferred to the Diocese of Milwaukee. Mr. S. F. Peck acted as layreader until August 29, 1886, when the Rev. Joseph Moran, Jr., began his work conducting services in the Court House. A Church building on the corner of 8th Ave West and Third street, having been erected was used for the first time with a celebration of the Holy Communion at 7:00 a. m. on Nov. 28, 1886, the First Sunday in Advent. W. W. Paddock, W. R. Durfee, S. F. Peck, B. B. Scott, Col. and Mrs. Bowen, D. G. Sampson, C. A. Lamoreaux, Mr. and Mrs. Geo. Merrill, Mr. and Mrs. R. G, Rodman, Sr., Mr. and Mrs. Geo. H. Kennedy, the Haring and Carrington families, were some of the prominent laymen identified with the work. Ashland claimed a population of about three thousand at this time, and the Church property was valued at $10,000. In 1888, during the boom days, Ashland's population reached its height. Perhaps 15,000 people made up the busy city in which seven lumber mills were operating night and day. The Rev. Joseph Moran, Jr., terminated his work in 1889 and the Rev. Herbert H. Barber and the Rev. H. B. Collier, Deacon, supplied until Nov. 30, 1890, when the Rev. Frederick W. White became Rector, remaining until April 1, 1894. He was succeeded by the Rev. Wm. J. Cordick on July 1st, 1894, remaining until May 31, 1898. The Rev. A. Geo. E. Jenner, Archdeacon of Ashland, was rector from August 1, 1898 to May 29, 1901, and the Rev. Francis G. Williams from May 15, 1902 to July 21, 1904. During his rectorate a rectory was built costing $4,700 and the present beautiful church and guild hall designed by Mr. Sutcliffe were erected on the corner of 7th Ave West and Third street, at a cost exceeding $27,000. Laymen prominent at this period were Col. J. H. Knight, J. W. Cochran, W. G. Sanborn, R. G. Rodman, Jr., Wm. Wilkins, Jos. T. Hooper, Geo. S. Rodd, W. G. Sanders, W. H. Hinkle, C. G. Bretting, J. F. Van Dooser and S. M. Enochson. Records show one hundred and twenty-five families and three hundred baptized persons with a hundred and fifty communicants in 1904. In 1907 the parish reached its largest communicant list with one hundred and ninety. With the passing of lumber, the population of Ashland dwindled carrying away many Church families and presenting the problem of a shifting population. In 1911 only fifty-five families and a hundred and twenty-three communicants remained. The Rev. Albion H. Ross labored from Dec. 1,1904 to Dec. 1, 1911, through the period of readjustment. He was succeeded by the Rev. Joseph D. Salter on Dec. 30, 1912 who remained until June 8, 1914. The population of Ashland fell to eight thousand in 1914 and the parish claimed only fifty-two families and less than a hundred communicants. On Nov. 22, 1914, the Rev. Harry S. Ruth assumed charge and has remained to date. Having reached eleven thousand inhabitants the city is slowly becoming a stable commercial, industrial and agricultural centre. Since the World War the majority of the young men and women have left the parish and during the last ten years the parish register presents a curious record of short lived additions and many removals. Nevertheless the work continues hopeful and scores of young people well instructed have gone forth to strengthen other parishes. There are over a hundred and thirty-five confirmed persons in the parish and the plant with its beautiful church and guild hall valued at $75,000 is one of the show places in northern Wisconsin. Of the early settlers and pioneer parishioners there remain Mrs. R. G. Rodman, Mr. and Mrs. Geo. Merrill, Mrs. W. R. Durfee, while Mr. A. W. Sanborn has continued as Senior Warden for many years. R. G. Rodman, Jr., acts as Missionary Treasurer. Other vestrymen at present are R. C. Bretting, Dell Kuhn, Roy J. Murphy, W. E. Chase, Dr. R. L. Gilman, and A. W. Bowron, one of Ashland's earliest settlers who has been identified with St. Andrew's almost since its inception. Mr. C. E. Rittenhouse and wife, of Georgetown, D. C, deeded a lot for a church building, on April 1, 1857. Two years later Mr. Thos. Carrington began work as a lay reader. On April 8,1870, the mission was organized and in October of the same year a church was completed, costing $1,500.00, the first Church building in Bayneld county, the money being contributed by prominent Churchmen in all parts of the country. Bishop Armitage visited the mission in 1871, Bishop Welles in 1875, Bishop Brown in 1879 and Bishop Grafton in 1889. In 1893 the church was restored, enlarged and beautified, and in 1906 a vicarage was built. The first missionary priest was Rev. J. A. Davenport, 1875. Others in charge were N. D. Stanley, H. B. St. George, A. E. Clay, Herbert Webster, and A. H. Ross. Rev. Harry S. Ruth, of Ashland, is now in charge. At the present time Bayneld is emerging from the effects of a passing lumber industry, and only a few communicants remain among the 1200 inhabitants of the village. The first services in Berlin were held in a hall over what is now the Wilson garage. The present church was built in the pastorate of the Rev. Wm. E. Wright. The cornerstone bears the date 1870. The guild hall and vicarage were built later, but there is no record of the year, or in whose pastorate this was done. An incomplete list of the clergy is as follows: Rev. Wm. E. Wright, 1869; Rev. A. C. Fliedner, 1891; Rev. Llewellyn Merrill, 1898-1899; Rev. John Jetter, 1900-1901; Rev. J. M. Raker, 1901-1902; Rev. Geo. H. Kaltenbach, 1902-1905; Rev. Arthur Q. Davis, 1906-1912; Rev. Fr. Jordan, 1912--? ; Rev. Wm. Chas. Bimson, 1914-1915; Rev. Geo. T. Gruman, 1916-1917; Rev. Joseph H. Smyth, 1921. Berlin is a manufacturing town, and an important dairy center, one of the factories of the Carnation Condensed Milk Co., being located here. It is a progressive town of over 4000 inhabitants, predominant and increasingly Polish. Our Church has suffered as in so many other small towns, in that the older members have gradually been lost by death, and the young people have found it necessary to leave home in order to attend college or in order to obtain remunerative employment. The Rev. 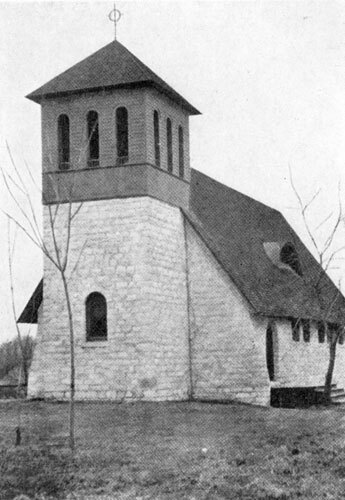 Henry H. TenBroeck held the first services of the Church in Big Suamico. These were held in some of the houses of the members of the congregation, and, I think, in the Doran School House. This was in 1874 and 1875. In 1876, the Rev. George A. Whitney, rector of St. James' Church, Green Bay, took charge of the congregation, and at the Council of 1877, St. Paul's Church was reported as an unorganized mission. On October 13th, 1878, the mission was organized by Bishop Brown with Rev. Fr. Whitney in charge, with Mr. Willam G. Burton and Mr. James Black, Wardens; Mr. Henry D. Summerville, Clerk; Mr. E. Tremble, Treasurer. Fr. Whitney resigned in 1879 and the Rev. Dr. Dafter, who had resigned the rectorship of St. Paul's, Fond du Lac, and had been appointed missionary at Oconto, Peshtigo, Marinette and parts adjacent, took charge. Under his leadership, the little church, 24x64, was erected. This was accomplished by the united work of the whole congregation. Mr. John Cook gave the land; Mr. E. Tremble gave a goodly share of the lumber; Mr. John Crooks gave the stone for the foundation; Mrs. George Horn and Mrs. Edwin Ferguson solicted funds from the whole communty; the ladies gave suppers and sales; the men quarried the stone and hauled them, and hauled the lumber and did the greater part of the work. The cornerstone of the church was laid by Bishop Brown October 12, 1881, and the church was consecrated by Bishop Brown (most likely) in 1882. In 1884, the Rev. Joseph Jameson, then a Candidate for Holy Orders worked in the mission and prepared a large class for Confirmation, which was presented by Dr. Dafter. From the time that Dr. Dafter resigned Oconto and the mission here and took charge of Marinette only, until the coming of the present Vicar, the mission was ministered to by a number of Priests, Candidates and Laymen. The Rev. John U. Graf (a deacon) was here a few times; the Rev. James A. Upjohn, though residing in Fond du Lac, was in charge for a number of years; the Rev. Frank W. Merrill came a few times; the Rev. Dr. Dafter, when rector of All Saints, Appleton in 1895, came back for week day services and prepared and presented a large class for Confirmation; the Rev. C. M. Pullen came for baptisms and burials 1896-1899; and the Rev. Henry S. Foster came from 1900 to the Fall of 1906. The mission owes a great deal to Fr. Foster. He came for week day services and a good many Sunday services; he had the Rev. L. B. Hastings, then a candidate for Holy Orders, come here one summer vacation. Mr. (now Rev. Fr.) Hastings prepared a very large class for Confirmation and is very kindly remembered by the congregation today; also he had three devoted laymen come out for services, viz. : Messrs. James T. Armstrong, Ralph W. Smith and Evan Townsend. Also Fr. Foster was instrumental in getting the present and only resident Vicar the mission has ever had, to come here in the Fall of 1906, viz. : the Rev. Lucius D. Hopkins. Since his coming there has been a slow but steady and healthy growth. Through the liberality of the Bishops of the Diocese and their friends, and the liberality of the many kind friends of the Vicar and his wife, and the splendid cooperation and work of the members of the congregation, the mission has a vicarage and glebe, a commodious parish house and the Church bulding has been beautified and improved and church-ly furniture added to the equipment. The spiritual growth and development has been as steady and healthy as the temporal and shows that this loved Church of ours can do efficient work in a rural community. 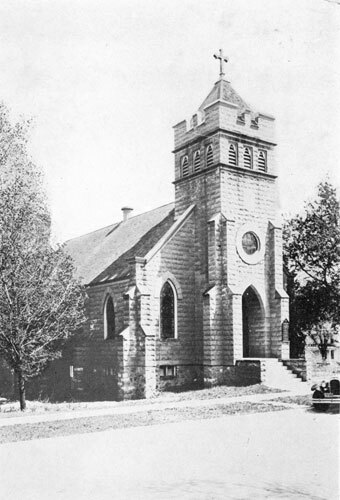 The mission of Grace Church was organized under Bishop Grafton, in 1896, in the same year the present church was erected, and completed, and on the Sunday after the Ascension, May 17th, the first public worship was held by the Rev. George W. Lamb of Menasha, whom the Bishop appointed Vicar. With the Vicar was associated the Rev. Edmund B. Young as curate, who conducted services on alternate Sundays. Mr. Young resigned on May 31st, 1897. On the same date Mr. Guy Burleson took charge, and read the services until September 1st, 1897, at which time the Rev. William T. Dakin was placed in charge, who continued to hold regular services until May 25th, 1898 when he resigned. On June 12th, 1898, Mr. Seldon P. Delaney, then a lay Reader of Fond du Lac took charge, and conducted the services until Sept. 12th, 1898. He was succeeded by Mr. Doane Upjohn, as lay Reader, who conducted services until May 21st, 1899. On June 1st, 1899, the Rev. William R. McCutchen, was placed in charge, and he conducted services until he was succeeded, again by the Rev. Seldon P. Delaney who took charge for the second time, and conducted occasional services from May 13th, 1900 to June 23rd, 1901, after which the work was turned over to Mr. George L. Smith, as a lay Reader under Rev. Fr. Delaney. The Rev. J. H. Gear held service from August 25th, till Christmas, 1901. On June 8th, 1902 the Rt. Rev. Reginald H. Weller visited the mission to make arrangements for a resident priest, and the congregation agreed to raise $200.00 towards his support. On June 26th the Rev. James T. McGovern a Deacon took charge, who also held occasional service in a private home at Hilbert Junction, and resigned November 1st, 1903. On Christmas Day, 1903, the Rev. Rudolph Stahley took charge, Fr. Stahley took a great interest in the work, made many personal sacrifices to establish the congregation, and did much to beautify the property, the evidences of which are still visible. He served the mission nearly three years, the longest pastorate so far, and resigned on Ash Wednesday, 1906. On Easter Monday, 1906, the Rev. Thomas N. Harro-well took charge, and resigned on December 2nd, 1907. On October 10th, the Rev. Anton A. Mueller took charge, and built up a considerable congregation. During Rev. Fr. Mueller's administration the name of the church was changed from Grace Church to St. Boniface. The church being now free from debt was duly consecrated by Bishop Grafton, July 17th, 1910. During Fr. Mueller's time, a handsome guild hall and rectory was built, the vicarage is one of the finest in the Diocese. These two buildings were erected at a cost of $10,000. Bishop Grafton contributing largely to the fund. Fr. Mueller resigned Sept. 3rd, 1916, having served the mission nearly seven years. On September 1st the Rev. Alexander Pflaum took charge, and resigned on November 13th, 1920, having served the mission four years. The Rev. H. I. Beale took charge on September 10th, 1922, and resigned on May 13th, 1923. The present Vicar, the Rev. Francis P. Keicher, was called to the mission December 15th, and took charge on January 1st, 1924. During Fr. Keicher's administration considerable improvements have been made, a new hot water plant having been installed in the vicarage, the furnaces in the church replaced so that the church could be used in the winter, the church replastered and painted, and an altar rail erected. There is a vested choir of girls, and a large troop of Boy Scouts. Some of these boys serve at the altar. The Church School and the congregation are rapidly growing. In March the Vicar baptized eight in one family, representing four generations, the youngest aged five and the oldest eighty-four. St. Margaret's Guild of women is an active band of workers, of which Mrs. Wm. J. Paulsen is president. The present officers are: Wm. J. Paulsen, Senior Warden; Wm. Aebischer, Junior Warden; Walter A. Kurtz, Treasurer; John M. Weeks, Anton Molg, G. M. Morrissey, Dr. J. E. Reinhold, vestrymen. This church and vicarage were built for Belgian immigrants about 1886 or 1887. The first priest in charge was the Rev. Rene Villatte. After his leaving our Communion, various priests were in charge. In October, 1908, Rev. J. B. Gauthier was made Vicar, and remained until his removal to Green Bay-in 1909. He was followed by Rev. Fr. de Villereal, who remained not a year. Until the death of Fr. Gauthier in 1923, this parish was in his charge. Services are held regularly by Rev. Fr. Aveilhe of Green Bay. The services always heretofore in the French language, now are in English, and there is a faithful band of people who adhere to the Church. The mission was started in Eagle River in 1900 or 1901 with Rev. C. M. Hitchcock from Rhinelander in charge. Services were held over Morgan's store with from 6 to 10 attendants, only two of whom were communicants, Mrs. Elizabeth Flanagan, (deceased) and her daughter Mrs. Margaret Mc-Kenzie, who still lives in Eagle River. Rev. Fr. Hitchcock was followed by Rev. Geo. M. Babcock, also from Rhinelander who presented the first confirmation class, John Radcliffe and F. G. Hall, both deceased. Bishop Weller, then coadjutor, confirmed. During Father Babcock's time, services were held in a small building which then stood across from the telephone office but is now the Telephone Company's garage. Also in a small building on Wall street which is now Behn Bros.' tin shop. During this time, Mr. Grant, a student and Deacon Geo. H. Kesselhuth each conducted services for a short time. While Rev. Fr. Babcock was still in charge, the mission room was changed to a room upstairs in the Roderick building over what is now the Sport Shop. In July, 1905, Fr. Babcock was followed by Fr. James M. Johnson also from Rhinelander. In 1910, a church building was erected and in November, 1910, Rev. A. N. Samwell was made priest in charge of St. Ignatius Mission. 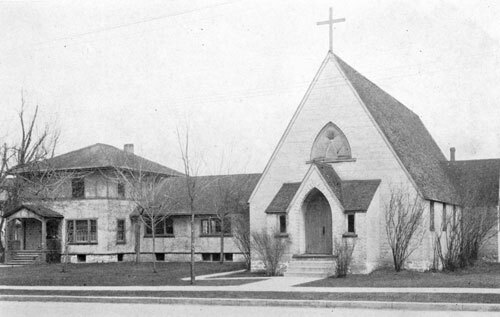 The new church was opened Dec. 21, 1910, St. Thomas' Day, with Fr. Johnson from Rhinelander, assisted by Fr. Samwell of Eagle River. The organ was the gift of the late Bishop Grafton. The first class to be confirmed in the new church, March 9, 1911, consisting of seventeen members, was presented by Fr. Samwell and confirmed by Bishop Weller, then coadjutor of Fond du Lac. In November, 1912, Fr. Samwell was followed by Rev. John E. Hodson who stayed but a short time. For a time there was no priest in charge. Then the Rev. Lewis H. Webster came in March, 1914. On the Feast of the Transfiguration 1914, Bishop Weller consecrated the church, assisted by Rev. Campbell Gray of Rhinelander, Rev. W. D. Trowbridge, Dean of Michigan City, Rev. C. Hinton of Antigo, and Rev. L. H. Webster, curate of Eagle River. Fr. Webster left in June, 1917, since when Fr. Gray of Rhinelander, Fr. Mason of Rhinelander and Fr. F. C. St. Clair of Antigo, have been in charge. During this time Rev. E. B. Ellis was priest in charge for one year and Dr. John Lloyd from March to October of one year. Fr. St. Clair is now in charge holding services once a month. Since the mission started in 1901, seventy-nine confirmations have been made, all by Bishop Weller. The mission of the Precious Blood was at first begun as the mission of Bon Pasteur, for Belgian immigrants, nearer Little Sturgeon in a log house, some time in 1885, by the Rev. Rene Villatte, ordained in Switzerland by Bishop Herzog of the Swiss Old Catholic Church for the Bishop of Fond du Lac. Later in the year, or possibly the next year the church was built on its present location purchased by Bishop Brown. The vicarage was built at the same time. Fr. Villatte continued in charge until he founded the Church at Dyckesville, or Duvall, when he secured the services of Fr. Proh as an assistant, officiating in both places. In 1889 the Rev. J. B. Gauthier. who had been acting as a lay reader, was placed as priest in charge on his ordination. Fr. Gauthier continued in charge until 1891 when on his removal to Canada, the Rev. A. P. Curtiss took charge for some months. After his retirement for some time the mission was served from Ahnapee, and there were various clergy officiating until the return of Fr. Gauthier. In 1908 Fr. Gauthier removed to Duvall, and the Rev. A. P. Curtiss took charge. After fifteen months he resigned and Fr. de Villareal took charge. Various clergy took charge and in 1912 Fr. Lops became Vicar. He was the last resident priest, and stayed for some years. The parish is now under the charge of the Vicar of Algoma. In 1745 Augustin de Langlade, and his son, Chas. Michael, first permanent white settlers in Wisconsin, came to La Baye Verte. They were greeted by a small, poorly defended stockade on the west side of the Fox River, which offered its protection to these pioneer settlers. Nothing daunted, they established themselves on the east bank of the river. Thus was laid the foundation of Green Bay. This early time was a time of changes. The French lost control of the territory and England stepped in. The fort was then called Edward Augustus. No point of interest marks the progress of civilization under the English regime. These were days of waiting and unnoticed development, and in 1776 the Colonies, shaking off the yoke of the mother country were encouraged in a feeble way to establish frontier settlements. The name of the fort was again changed in 1816, to Fort Howard and later a military encampment was established, some miles south of the fort, on the east side of the river, called Camp Smith. This military settlement attracted a few families, who for the purpose of trade opened stores and shops in the neighborhood and a village sprang into being. This village was called Menomoneeville, alias Shanytown and Bellevue, and was located about where Allouez is now situated. Things for a time looked promising and a tract of land north of Camp Smith was taken from the Government upon which was built a school, and work was begun to civilize and Christianize the Indians. In the year 1824, the Rev. Norman Nash, a priest, of Philadelphia, came to these parts with an assistant, who acted as school teacher, by the name of Albert G. Ellis. There seems to have been some differences between these two men and they parted in their labors. The Rev. Norman Nash, opening a school on the west side of the river and Ellis staying with the families in Shantytown. This was the beginning of Christian work and teaching in this locality. The work on the west side failed because as we find in the diary of Ellis, Nash was a dreamer, he loved nature and played a fiddle and painted pictures, and soon tired of the rough, wild life among the Indians. 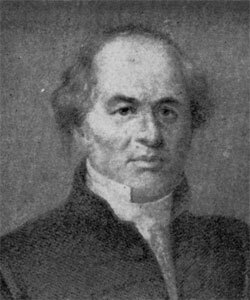 In 1826, the Rev. Eleazer Williams, a deacon, reputed to have been the lost Dauphin of France, came to this field under the appointment of the Domestic and Foreign Missionary Society of the Episcopal Church. He held religious services at the Fort and other small stations, baptising Indians and instructing converts to the Faith. Williams' efforts were fitful and can not be counted to mean anything toward the permanent establishment of a Mission. The Rev. Richard Fish Cadle, a man of roving disposition and intense missionary zeal, having established St. Paul's parish, Detroit in 1924, with failing health came to this territory in 1828, with his sister, Sarah Cadle, as school teacher, and took up his residence at Shantytown, reviving the school and starting the regular round of religious services. Here was developed a school of some importance, which at one time was called the University of Wisconsin at Green Bay. It was always known as the Mission and continued its usefulness years after the families had left the town. A meeting for the purnose of organizing a parish was held at the house of Louis Rouse, who lived just outside the limits of Shantytown on the north, on Sept. 16, 1829, and was attended by persons belonging or attached to the Episcopal Church, at which meeting an organization was effected by the election of two wardens and eight vestrymen, in pursuance of the act of incorporation and the adoption of a constitution. Judge James D. Doty was chairman of the meeting and A. G. Ellis was the secretary. The Rev. Richard Cadle was present and assisted in the organization and in the adopting of the constitution, but was not chosen Rector until the November following. On the Vestry of Christ Church at the time of the incorporation were, Daniel Whitney and A. G. Ellis, Wardens; James D. Doty, Robert Irwin, Jr., Alexander J. Irwin, Henry S. Baird, John P. Arndt, Wm. Dickenson, Samuel W. Beal and John Lawe, Vestrymen. The secretary was instructed at this meeting to send a copy of the constitution to Robert Irwin, Jr., then at Detroit attending as delegate the Legislative Council, with a petition for a charter. 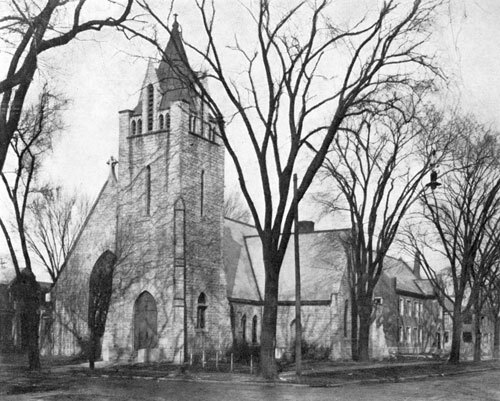 All was accomplished to the success of the undertaking and Christ Church parish was incorporated under the Territorial Laws of Michigan, in the fall of the year 1829. The population of Shantytown consisted of about twelve American families, outside of the garrison of Fort Howard, and the heads of these families at once took steps to build a church. Navarino, the nucleus of modern Green Bay, was platted in 1830 by Daniel Whitney, proprietor, and at once showed signs of progress. Owing to its nearness to the fort and its natural commercial advantages it soon became a prominent settlement. The families moved from Shantytown to Navarino, bringing with them their earnest desire to build a church. The first Church services in Navarino were held in the yellow school house on Cherry street, just back of where the Masonic Temple now stands. At this time, 1831, there came from the East a new teacher for the mission, John V. Suydam, a zealous layman, who greatly helped the efforts of the small congregation. The ever generous Daniel Whitney at once offered the present site upon which to build. His offer was accepted and funds were solicited for the erection of a Church building. In 1834, the Rev. Jackson Kemper, with a companion, the Rev. James Milnor, under the authority of the Domestic and Foreign Missionary Society, visited these parts to inspect Cadle's work. It is interesting to note from Kemper's journal, an account of the hospitality offered them by our early parishioners. "Dined at Mr. Whitney's at Navarino, there besides we three and Mr. and Mrs. S. W. Beal, Mr. Arndt and nearly a dozen officers from the garrison in full uniform--pitcher full of lemonade and port, maderia and champagne wines--roast pig, veal, ham, venison and veal pie--salad--cranberry tarts and floating island--cheese, raisins, almonds, English walnuts, filberts. The two doctors from the fort drank no wine. Have established a. society which now includes eighty odd, on principle of total abstinence." Mr. Cadle's health failing, he pushed on to work at Oneida and then to Nashotah, where a school was being started. He was succeeded in the work here by the Rev. Daniel Brown, and in 1838 the corner-stone of the new church was laid by Bishop Kemper, who had been consecrated the first Missionary Bishop of the Northwest in 1835. The Church permanently settled with a hquse of worship, took on the usual action of any Parish institution, ministering to the sons of men, in all their needs, baptising, confirming, feeding with the Spiritual Food, solemnizing marriages, pardoning sinners, encouraging her children and burying the dead. And now the thoughts go back with fond recollection to the old frame church, so plain, yet so dear, with its high picket fence and box pews. Round it cluster many sentiments which are most sacred to the family life of Green Bay. There are those in the parish who tell of the gay soldiers coming in companies along the street to worship in the old church. They tell of bright things and sad things, which through the years make history for the parish. The old church was consecrated and kept in fitting manner its fiftieth anniversary. A Sunday School was started on the hill in 1873, out of which it was thought a parish could be formed and St. James' Church was instituted and a beautiful building erected on the corner of Monroe Aye. and Lawe St. A financial panic followed this effort and it failed. The members came back again to the old church. Following Bishop Kemper came Bishop Wm. Ed-mond Armitage, as second Bishop of Wisconsin. The Diocese was then divided and the Diocese of Fond du Lac was made with the Rt. Rev. John Henry H. Brown, D. D., as Bishop. He was succeeded after a useful life by the Rt. Rev. Chas. C. Grafton, D. p., who made his visit to Green Bay in 1889. On Christmas Day, 1891, the vested choir was inaugurated in Christ Church and did most acceptable service, until the fire which on the night of July 3, 1898, completely destroyed the venerable old landmark. Many of the articles of furniture were saved, but the building was ruined. The bell which was a gift from Dr. Daniel Whitney, was destroyed in this fire, but the Communion plate marked Navarino, 1840, from the same benefactor was saved. The congregation was crushed by its loss, but not discouraged, steps were at once taken to rebuild. In September, 1898, Bishop Grafton laid the corner-stone of the present handsome stone building. Before the church was fully completed the Rev. Henry S. Foster, became Rector, who, much loved by his people, built up the spiritual condition of the Church and materially lessened the debt. Failing in health, he was forced to leave his work and was succeeded by Rev. James Francis Kieb, who on October 1, 1907, became Rector. During the latter's pastorate the money to pay off the debt was raised and the consecration of the present church on the eightieth anniversary of the incorporation of the parish took place. The Rev. James F. Kieb was succeeded by Rev. Mager McMurray in 1917. Church of the Blessed Sacrament, Green Bay. St. Olaf's Church, Amherst. Church of the Holy Nativity, Jacksonport. Many of the Belgians from Gardner and Duvall had removed to Green Bay. There was still a remnant of the mission Villatte had formed there. In 1908 Bishop Grafton used some money given him for the building of a new church and erected the little church and vicarage attached now standing on N. Webster Ave. The Rev. Fr. de Villareal, ordained by Bishop Koslowsky was placed in charge. It was a difficult work, and Fr. Gauthier, as best fitted to deal with it was appointed to the mission, and the former Vicar changed to Duvall. Here Fr. Gauthier continued until his lamented death in 1923. The mission was vacant for a year, and then a new era of progress was initiated by the appointment of the present Vicar, Rev. Carlos A. Aveilhe. From being a mission to Belgians it has become one of various nationalities, and a good number of Oneidas, now resident in Green Bay attend the services. Many improvements have been made. The guild hall built by Fr. Gauthier has been put in order, and the apsidal chancel added by him, now used as a sacristy, will doubtless be soon thrown into the church to provide more seating. The service is now entirely in English, and the Book of Common Prayer used. The first service of the Church in Jacksonport, was held in the village school house, Aug., 1882, by the Rev. W. R. Gardner, general missionary, and the Rev. Canon Richey of St. Paul's Cathedral, Fond du Lac. After the service, there was a meeting of the men. It was decided that a glebe farm be bought. One hundred dollars were raised, and sixty acres of land were bought at five dollars an acre. Canon Richey saw a deer coming out of the woods, and remarked, "That is the place on which to build the church." In 1885 the Woman's Auxiliary of Boston, Mass., sent funds to build a vicarage, and in 1886 work was begun on the Church building. 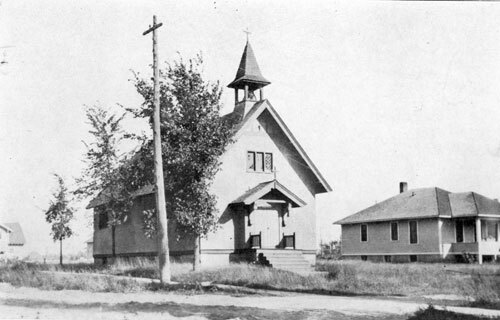 The first service was held in it July 25, 1886. The Rev. O. S. Prescott, rector of St. Peter's Church, Ripon, preached the sermon. The Rev. W. R. Gardner remained in Jacksonport until in October, 1886, he became the Rector's assistant of the Church of the Advent, Boston. The Rev. E. R. Sweetland became Vicar in 1887, and resigned sometime after Dec. 23, 1888. The Rev. Joseph Jameson became Vicar August, 1889, and remained till he reached the retiring age June 3, 1924. In the latter part of the '30s the Rev. Richard Cadle, a Missionary to the Oneida Indians, made his first missionary trip to the Rapids and held the first service in Manitowoc County. In his report made in February, 1842, he reports having preached to a congregation of about sixty persons in a private house at the Rapids, about three miles up the river. This was the beginning of St. James parish. From that time on missionaries visited here and held services at various times. On February 28th, 1848, the congregation was organized under the name of St. James Mission. The Rev. Gustavus Unonius, a native of Sweden, and the first graduate of Nashotah House, was called as its first Rector, and assumed his duties on April 20th, 1848. At the time, there were six families and twenty-seven communicants. In 1851 the Rev. G. P. Schetky become Rector, and it was he who erected the old Church building at Ninth and Chicago streets, at the cost of $1,500. The cornerstone was laid by Bishop Jackson Kemper, on November 24th, 1851, and the Church consecrated on St. James' Day, July 25th, 1852. Next was the Rev. George W. Thompson, whose ministry covered only a short period. In 1854, while nursing cholera patients, he fell a victim of the disease and lost his life for his people, and thus St. James added at least one martyr to the long list of God's chosen ones. His remains lie at rest in Evergreen cemetery, this city. This martyr was succeeded by the Rev. Mr. Hoyt, who served from 1855 to 1859. In 1859 the Rev. G. B. Engel became Rector, and during the Civil War he resigned to become the Chaplain of the 14th Wisconsin Infantry, and thus St. James not only added heroes of the Cross but also heroes of our Country. In 1865 the Rev. Lyman Freeman took charge, who was followed by the Rev. F. H. Dooly in 1866, followed by the Rev. George H. Ward in 1870, the Rev. H. DeGarmo in 1871, the Rev. F. R. Haff served till 1873, and was succeed by the Rev. James DeForrest who served three years. Then followed the Rev. M. V. Averill, in 1882 the Rev. H. C. Costello, in 1884 the Rev. T. H. T. Bray, in 1886 the Rev. David Laseron. This brings us up to our beloved friend and former Rector whom we all remember well, the Venerable Dr. B. Talbot Rogers, who took charge in 1890 and was ordained in the old church thirty-five years ago. After faithful service he was succeeded by the Rev. S. R. S. Gray, who built the present new church. The succeeding Rectors to the present are as follows: 1907, the Rev. H. B. Pulsifer; 1908, the Rev. G. H. Kalten-bach; 1908, the Rev. L. B. Hastings; in 1910, the Rev. John Oliphant; in 1912, the Rev. William Reynolds; in 1914, the Rev. William J. Vincent, and in 1915, the Rev. Francis P. Keicher, 1924, the Rev. William T. Reynolds, the present Rector. Two deacons also served this Parish for a time, they are: Rev. Newell D. Stanley and the Rev. J. A. M. Rickey. The cornerstone for the new Church was laid by the Rt. Rev. Reginald H. Weller, D. D., on August 14th, 1901, and was dedicated on St. James Day, July 25th, 1902. The old Church was deconsecrated, according to Canon 26, by the Rev. S. R. S. Gray, acting for Bishop Grafton. The present Rector was called to St. James from the Diocese of Erie, where he held the office of Arch-deacon and Executive Secretary. He assumed charge of St. James' Society, a group of women comprising both members and non members of the parish of which Mrs. Mabel Killen is president. The Rectory, an imposing old house situated on North Eighth street just above the church, cost $10,000, of which $6,000 has already been paid. The balance is secured by a first mortgage assumed by St. James Society. This $4,000 is the only debt of the Parish. The Rectory answers two much needed purposes the home of the Priest, and as a parish house as well. Most of the guilds and societies hold their meetings here, and many social affairs. The Church School grows steadily under the efficient leadership of Mr. Eugene Clement, superintendent, and a corps of splendid teachers. 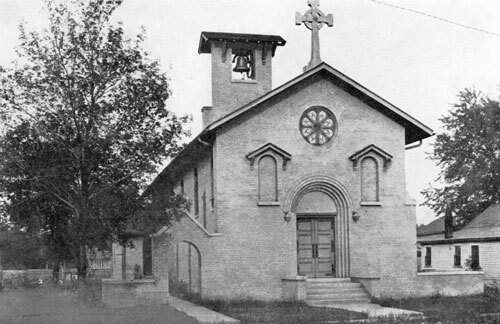 St. Paul's, Marinette, was organized as a mission in the fall of 1873; as a parish in 1899. In 1857 the Rev. Charles C. Edmunds, rector of Christ Church, Green Bay, reported to the Convention of the Diocese of Wisconsin, "Menominee, 60 miles north of Green Bay, I have visited, but was not able at that time to hold service there. I have made arrangements for the future however." At that time Menominee and Marinette were practically one town. While the Rev. H. H. TenBroeck was living in Oconto, 1870-1871, a few services were held in Marinette. After the organization of the mission in 1873 the Rev. Francis Moore came to Marinette, and remained until sometime in 1874. The services were held in a hall over a store on the main street. Mr. J. K. Wright circulated a subscription list for the mission and got 48 signers to contribute $729. The officers for the mission were: L. B. Noyes, Warden; J. P. Dous-man, Clerk; and J. K. Wright, Treasurer. Rev. William Dafter became Vicar in 1875. After using various halls about town for the services, in 1881 a small wooden building was erected on the present location. This land was given by the Hon. Isaac Stephenson, a resident of Marinette, one time United States Senator from Wisconsin. The present rectory was erected by the side of the church in 1883. The Rev. William T. Schepeler became Vicar in 1896 and in 1899 the mission was made a parish. The Rev. W. B. Thorne, 1901-06; The Rev. F. S. Penfold, 1907-10; The Rev. W. H. Willard-Jones, 1911-14, during whose rectorate the church was incased in brick and a chapel added; The Rev. R. T. Hicks, 1915-16; The Rev. G. M. Babcock, 1917-19; The Rev. C. B. N. O. Reader, 1920-23; The Rev. E. P. Sabin, 1923. The town is named after "Queen Marinette", a leader of the Menominee Indians who once lived at the mouth of the river that now separates the two cities of Marinette and Menominee. It has been one of the largest lumbering towns of northern Wisconsin, and still has a number of mills. Various industries are beginning to enter the city; but as yet it is practically only a distributing center for this part of the state. St. Alban's Church, Marshfield, is but one of the results of the missionary activities of the present Bishop of Fond du Lac. In 1889 missionary work was begun here by Fr. Weller who was at the time Rector of the Church of the Intercession, and Archdeacon of Stevens Point. 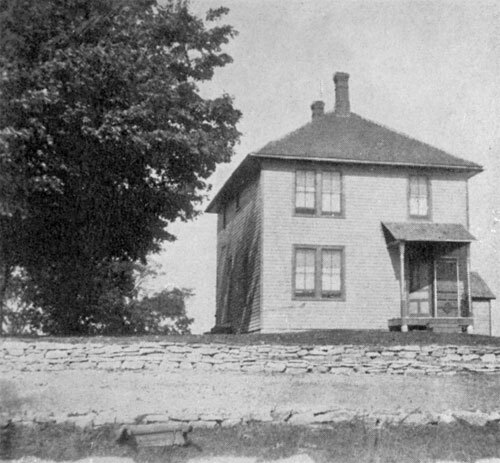 A house to house canvass of the town was made by Mr. George Shelton, one of the lay-workers of the Intercession, Stevens Point, which showed two communicants resident in Marshfield: Mrs. E. C. Pors, still active in the work of the Church had recently moved here from West Bend, and the other a Mrs. Dewey. 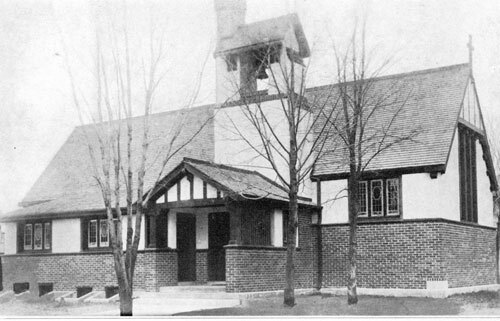 Occasional services were held in the Knights of Pythias Hall, and a Confirmation class organized. Six persons were prepared and presented for Confirmation and admitted to Holy Communion. Regular lay services were later begun and the Sacraments were administered as frequently as Fr. Weller could come to Marshfield. At this time, as Archdeacon of Stevens Point, Fr. Weller was carrying on missionary work in Medford, Amherst, Grand Rapids, Centralia and Marshfield. With this increasing work it was necessary for the Archdeacon to have assistance and two newly ordained deacons, graduates of Nashotah House, the Revd. Walter S. Trowbridge, and the Revd. Mr. Branscombe accepted work under Fr. Weller's guidance. The Revd. Mr. Trowbridge was assigned to Marshfield and the Revd. Mr. Branscombe to Centralia. Upon his ordination to the priesthood Fr. Trowbridge became the first resident pastor of St. Alban's Church. He also took over the work in Medford. In the Spring of 1894 St. Alban's Church entered upon a new period of growth. Mr. William H. Roddis, a devout layman and a communicant of Milwaukee Cathedral moved with his family to Marshfield. Mr. Roddis at once threw himself into the work of building up the mission. A building was rented and fitted up as a chapel which served until the present Church building was erected a few years later. Mr. Roddis took an especially keen interest in the Sunday School and other work for young people and also acted as a lay reader as the occasion demanded. With such an active layman to assist him, and with a priest resident in the community Fr. Weller determined to secure a site for a Church building. On one of his visits to Marshfield he discovered that a desirable piece of land could be secured near the center of town. This property was bought and a part of it sold for the site of an office building, the proceeds from the sale forming the nest egg for the building fund. Plans for the Church building were drawn by the Revd. Fr. Branscombe. The building, which is a frame structure seating about 125 people is copied after the Church of the Ascension, Merrill. Mr. Roddis continued to work diligently for the good of St. Alban's and such progress was made that at the Special Council of 1900 the mission was formally admitted into union with the Council. Mr. Roddis' interest in the Church was not limited to the needs of the local congregation, to which he gave liberally of his time and means, but extended into the diocese at large and he frequently was a member of the lay delegation to the General Convention from this diocese. His death on November 6th, 1920, brought to a close in this world a life full of faith and good works. Requiescat in pace. In 1921 a beautiful guild hall was erected. This is a handsome brick structure which serves the community at large as well as the congregation of St. Alban's Church. Club rooms for boys are maintained in the basement, while the main hall is in constant demand for meetings of all kinds. The congregation hopes, one day, to erect a new church building in keeping with the Guild Hall. The following clergy have been the vicars of St. Alban's Church: Revd. W. S. Trowbridge, 1895-97; Revd. G. H. Kal-tenbach, 1897-1901; Revd. William Dafter, 1904-11; Revd. H. M. G. Walters, 1911-12; Revd. Graeme Davis, 1913-16; Revd. Arthur Burton, 1916-18; Revd. H. A. Link, 1919-24; Revd. John E. Wilkinson, 1924-; and the following have held locum tenencies for various intervals: Revd. Frs. Grubb, Kroll, Knauff and Masse. In 1876, Rev. C. D. Mock laid the foundation of the Church in Medford. With the assistance of a few zealous laymen and encountering the inconveniences and disadvantages of a frontier saw-mill town, he began his work by saying the services in dwelling houses, then he rented the public hall, called Music Hall. He established a misison and named it Holy Cross. Those who assisted him at that time were: Mr. J. B. Hull, Mr. Edgar T. Wheelock, Mrs. Clem. L. Brown, Dr. and Mrs. Frederick Barrett, Miss Delia Damp, now Mrs. Cook of Stevens Point, Mrs. Tom McCourtney now Mrs. McDonald of Corrizoza, New Mexico; and Mr. and Mrs. C. A. Anderson. In beginning this work for God, these raised for themselves a memorial that can never crumble. Mr. J. B. Hull perceived that the mission should have a church building, so he raised by popular subscription, an amount of money sufficient to erect a suitable edifice to be dedicated to the service of God. A church was built with the money and it still stands. From the faithful, diligent efforts of these earnest people grew the present St. Mary's; for in 1881, according to the parish register, page seven, St. Mary's was organized and in 1900 admitted to the Council. The lot on which the Church building stands was donated by Mr. T. Mc-Courtney and Mr. Wheaton. St. Mary's was consecrated by Bishop Brown. The records of the mission are very imperfect but it was served for several years from 1890 by Ven. Reginald H. Weller, Archdeacon of Stevens Point, now our Bishop, and from 1901 by Ven. A. George E. Jenner, Archdeacon of Stevens Point, and Rev. Carl ton M. Hitchcock. Rev. Charles E. Huntington became Vicar in May, 1909, and served until the autumn of 1912. During the last year of his pastorate the present very comfortable vicarage was erected, it being the gift of the late Bishop Grafton. Rev. Alfred L. du Domaine was Vicar during 1922 and 1923, and Rev. Samuel Evans was Vicar from April, 1924 until April, 1925. 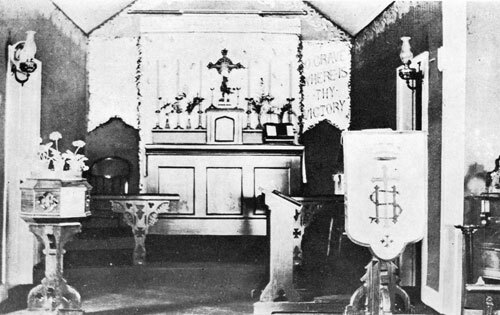 First service, Holy Communion in the Union Church with four Communions, April 12, 1915. Rev. Henry S. Ruth, Rector of St. Andrew's, Ashland, celebrating. Services at the residence of Dr. C. A. Critchber periodically until 1919 excepting during 1918. In December, 1922, the Rev. Alfred L. du Domaine, became Vicar of St. Mary's, Medford, and St. Philip's, Westboro, and missionary along the Ashland division of the Soo, and services were regularly maintained, Zion Swedish Lutheran Church being used and adapted for our worship. May 1st, 1923, the Rev. Samuel Evans succeeded Fr. du Domaine. During 1923, twenty persons, sixteen of them adults were confirmed. Services were regularly maintained, three times a month on Sundays, and occasionlly on week days by Fr. Evans. April 1st, 1925, the mission was again placed under the charge of Fr. Ruth of Ashland, and services have been maintained occasionally since that time to date. Mellen was organized as a mission by the Bishop, Jan. 1st, 1924. The Mission of the Ascension at Merrill has no written records back of the year 1896, and in a town of fluctuating population such as the northern Wisconsin towns alawys are, traditions do not survive. It is said, however, that Bishop Brown, that Apostle of Wisconsin, came here in course of his preaching trips, and the fact that he baptized a boy who afterward died, Oscar Harold De Vail, is still remembered. The first Church services were held in Merrill in vacant store buildings by various missionary priests, and Archdeacons Jenner, Weber and Schepeler are still remembered in this capacity. A student for the priesthood from Nashotah, Mr. Branscome, spent a summer here when the church was in process of being built, and our people remember it to him for good that he very zealously labored along with the carpenters on the building. Through the hard work of the little mission and the generosity of some of its friends, the building was completely paid for by the time it was built. In 1896 the Rev. 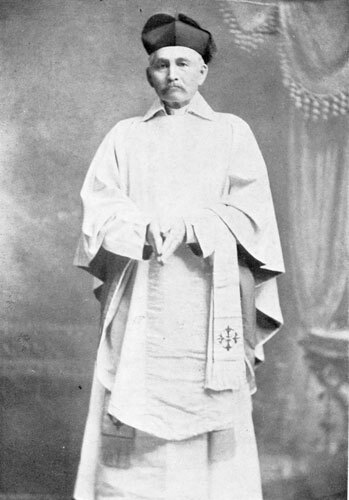 W. G. Blossom became the first resident priest. In 1898 he was followed by the Rev. Charles Trask Lewis who came as a deacon and was ordained priest at Tomahawk. For most of the time Tomahawk and Merrill have been served by the priests resident at Merrill. Father Lewis was succeeded in 1901 by the priest who is still revered as the patron saint of this section of the country, the Rev. Frederick Waldo Barker, who built the large vicarage which is now being used as a Monastery. He had a wonderful love for souls and spent himself without stint for his three missions of Merrill, Tomahawk and Mosinee. In fact his death in 1908 is often attributed to exposure and overwork. The people both outside and within the Church remember him with love, and a Year's Mind Mass of Requiem is celebrated even yet at Merrill. Father Barker was followed by the three short pastorates of the Rev. Fathers Raker, Webber and Arens. In June, 1912, the Rev. J. Russell Vaughn became Vicar, and he is remembered affectionately everywhere in this little city. In 1917 he volunteered for service in the great war and acted as first lieutenant until wounded while on duty at the front. After a short interim during which the little parish was ably ministered to by the Rev. Claude Reeder, the present Vicar was appointed on Ascension Day, 1918, and with him there has been associated in the pastorial work the other friars of the Order of St. Francis, and the Sisters of St. Claire, although the latter give themselves more especially to the ministry of prayer. A great many repairs and improvements have been made in the buildings during the last six years, a guild hall built under the church and the interest, attendance almsgiving and devotion of our people has slowly but steadily grown. The present communicant membership is seventy-five, the average attendance at the late Mass on Sunday thirty-five, and often there are twenty at the early Mass. A number of our communicants live in the country and can get to church but seldom and we are also blessed with several aged people too feeble to leave their homes who have the Blessed Sacrament carried to them regularly and who assist the parish by their loving interest and prayers. Among our many benefactors Bishop Grafton, Bishop Weller, Mr. Thomas J. Anketell and Miss Helen Price should be especially mentioned. In the Monastery the future missionary friars are being trained and in its chapel daily the seven-fold Office is sung and the Sacrifice of the Altar offered for the needs of Holy Church. A life of constant intercession is also carried on at the Convent. These two institutions are not parochial but since they have grown up in the parish and help in the parish life and work they should be mentioned here. In conclusion we chronicle the ordination to the diaconate on January 29, 1925, of the first man to be trained for Holy Orders in the Franciscan Monastery at Merrill, the Rev. J. Arthur Swinson, who now has the pastoral oversight of Merrill and Tomahawk under the direction of Rev. Fr. Joseph, O. S. F.
The first Church services in Mosinee were held by the Rev. Thomas Greene, missionary for the northern part of the Diocese of Wisconsin. A lot for a church building was donated by Mr. Joseph Dessert in 1866. Services were held in the school house and for five years Mr. Frank McReynolds the present senior warden, served as the lay reader. The Rev. Wm. E. Wright of Wausau, was in charge of the Mission from 1880 to 1890, Rev. A. J. E. Jenner from 1890 to 1893, Archdeacon Schepeler from 1893 to 1895, Rev. John A. Carr from 1895 to 1898, Rev. Wm. J. Cordick 1898-1899. 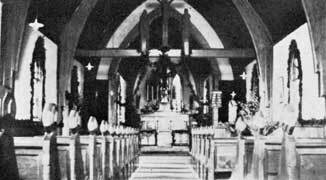 The church was built during the fall and winter of 1884-1885, was consecrated by Bishop Grafton on May 17, 1900. The Rev. Robert G. Os-borne, the first resident priest, had assumed charge on December 15, 1899, and through his efforts many improvements were made to the property, and a Guild Hall erected in 1901. Father Osborne resigned April 22nd, 1902, and was succeeded by the following clergymen: Rev. W. J. Cordick, 1902, Rev. F. W. Barker from 1903-1907, Rev. C. B. Blakeslee 1908, Rev. H. F. Arens 1911, Rev. C. B. N. O. Reader, 1913 to 1915, Rex. Alexander Pflaum, 1915 to 1917, Rev. Percy R. Deacon, 1917 to 1918, Rev. C. F. Hinton, 1918-1920. In 1916, during Father Pflaum's pastorate, the site of the old church on Main street was sold and plans made to erect a new church on Second street. 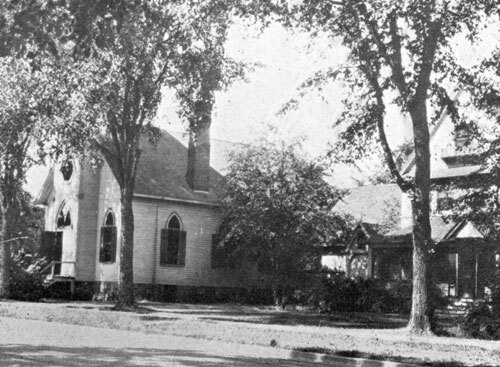 The Guild Hall was moved to one of the two lots purchased on Second street and was arranged and fitted to serve as a Church until the new building could be completed. 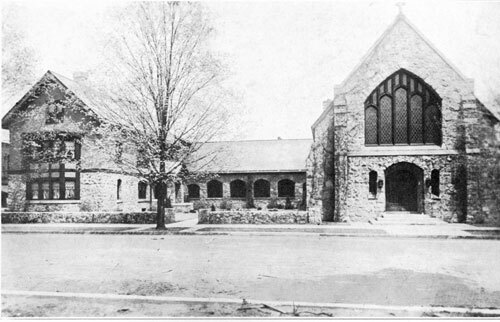 The first services were held in the new church on January 12th, 1919, by the Rt. Rev. R. H. Weller, D. D., Bishop of the Diocese, assisted by the Rev. C. F. Hinton the Vicar. The Rev. W. I. Rutan was the resident priest from Feb., 1921, to Sept. 30th, of the same year. From October 1921, the Rev. William C. Way has been the priest in charge. The present members of the Vestry are: Senior Warden, Mr. Frank McReynolds; Junior Warden, Mr. Louis LaMere; Treasurer, Mr. Earl A. Pemberton. 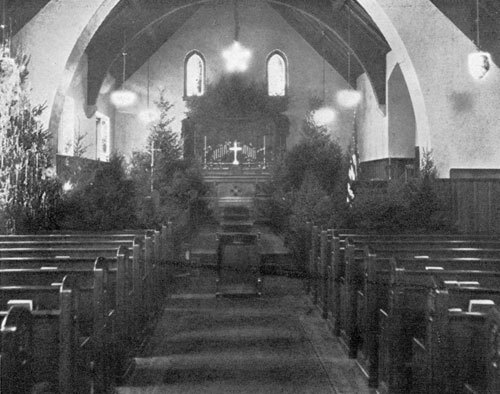 St. Thomas Church, Neenah and Menasha was formed by the union of St. Stephen's Church, Menasha and Trinity Church, Neenah, on Christmas Day, 1914, when the congregations of the two churches met in St. Stephen's Church, Menasha, for their first service. St. Stephen's Church was the older of the two. The church building was erected in 1858 largely through the generosity of Captain MacKinnon of the British Navy. Trinity Church, Neenah, dates from July, 1866. It was the outgrowth of the missionary work of the Rev. Simon Palmer and the Rev. George Gibson, missionaries at Appleton. The organization was perfected by the Rev. W. D. Christian of St. Stephen's Church, Menasha. Trinity Church was built in the Spring of 1870. The two churches had the same pastors from 1866 to 1880. Trinity Church was closed for long periods up to 1914. St. Stephen's Church has had a long list of Vicars. The outstanding names are those of Delaney and Merrill. The consolidation of the two parishes was a work of faith and the glorious outcome of Christian brotherhood. The committee which accomplished the union was composed of F. D. Lake, S. H. Clinedinst, J. M. Pleasants, D. T. H. MacKinnon, William Trilling and A. M. Little of Menasha; Harry Price, J. C. Kimberly, George Madson, H. S. Lyons and E. M. Beeman of Neenah. 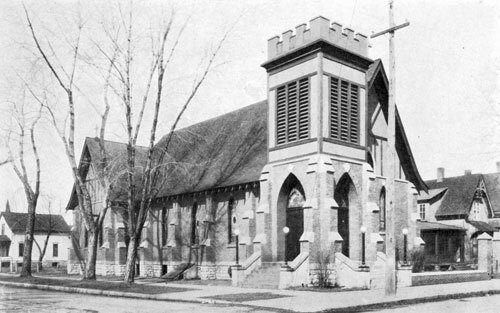 In 1915 the present site of St. Thomas Church was purchased. Rev. H. A. Wilson was called as Rector. Work was begun on the new Church edifice Sept. 20th, 1915. 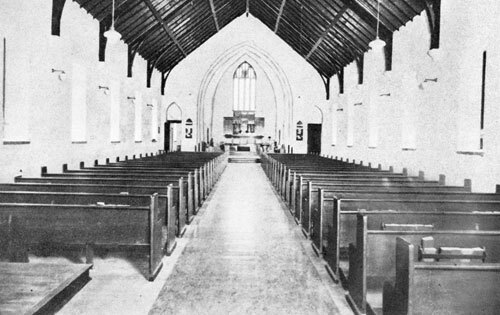 The first services were held in the new church on the 16th day of January, 1916. The church was consecrated on the 14th day of May, 1916. Rectors: Rev. H. A. Wilson, 1915-1917; Rev. W. G. Studwell, 1917-1920; Rev. R. A. Heron, 1920--. The parish has grown in strength and service since its inception in 1915. There has never been any question of the success of the union. The rectory was remodeled into a parish house in 1922 and the present rectory was built in 1923. The choir is a mixed choir. Its services are an offering to the Church. St. Thomas Church has a communicant list of 170 and a Church School of 110 pupils. It has three women's guilds, one of which does the work of a Woman's Auxiliary. The service of the Church in the community is along the line of children's work. Large and active troops of Boy Scouts and Girl Scouts are maintained. A children's play ground is under construction at the present time. The Church maintains a camp for its boys and girls on the east side of Lake Winnebago. The two cities of Neenah and Menasha have a total population of about 14,000. Each has its separate city government. New London had been visited in earlier days by clergymen but no foundation of a mission was made until January, 1901, when under the invitation of the Misses Blanch and Grace Thorn, the Rev. Seldon P. Delaney, then the Rector of All Saints' Church, Appleton, came to New London and started to hold services in the Thorn residence on West Water street. The little band of Church people met at various places and homes and finally in a hall over the Nayser Drug Store, under the able leadership of Rev. Fr. Delaney who found eleven communicants and added twenty-one others to the flock by Confirmation and a goodly number by Baptism. Rev. Fr. Delaney ministered until Sept., 1902, when Rev. Francis S. Kieb came followed by Rev. Frank W. Merrill, then Rev. Lawrence Kent, an artist as well as a priest. It was under him that the beautiful church was built, a memorial to Mr. John N. Hutchinson by his sisters, which was consecrated May 30,1905. Soon after the congregation with help from outside bought the adjoining property using the residence for a vicarage. The diocese now owns without debt one-half of a city block. The church is unique as it is a copy of an Italian basilica, and richly decorated inside. Rev. Frs. Day, Curtiss, Oliphant, Journey, Reynolds and Rhodes kept the work going and on Dec. 1, 1913, the present vicar, Rev. Francis S. Dayton, was sent by the Bishop. The present congregation counts eighty baptised persons and forty-two communicants, an active parish guild of seventeen members, an acolytes guild of three. The church is located on St. John's Place in the heart of the city, two blocks from the post office. The first service in St. Michael's Church was held on July 5th, 1901, by Archdeacon Rogers, the corner stone having been laid the Easter Monday previous. The first priests in charge were Fathers Smith and Porter. The Sisters of the Holy Nativity worked there from the Mother House. When Father Porter left in 1904, the church was closed for a time, but one of the faithful women of the mission kept the children together and instructed them in her home. In 1905, the church was renovated, the weekly Mass resumed, the children placed under the instruction of the Sisters, and a woman's guild was organized, Archdeacon Rogers directing the work of the mission, assisted by Rev. Fr. Lorey, now of the Order of the Holy Cross. The work for a while was under the care of the Benedictine Monks, but the best work in the history of the mission was done under Rev. Fr. Burton. A faithful guild of women for fifteen years provided fuel, light, repairs, and contributed generously to the Vicar's salary. It was through their efforts that the services were carried on. The children have always been our joy and inspiration. The Christmas Mystery Play, which is now being given in so many of our parishes, was first arranged for and used by the children of St. Michael's. Year after year, they entered into it with the same spirit which actuates the Oberammergau players. A guild hall erected in 1902 has aided greatly in the social activities. Being a railroad town, the population is a shifting one, and most of the former Church families have moved into Fond du Lac or elsewhere. When the Church is re-opened, as we pray God it may be, the work will have to start again from its foundation. The early records of the work here at Oconto were destroyed by fire about 45 years ago and consequently much of this is gathered from the memory of old residents. The work was begun in 1855 or 1856 under Bishop Kemper, who held services in the old Empire Hotel, corner Main street and Park avenue. Rev. Fr. Harmon from Green Bay then came here about every two weeks for a period of about two years and held services in a small building on the site now occupied by the Linglebach garage on the corner of Main street and Park avenue. After Fr. Harmon came Rev. Fr. TenBroeck, and at this time a church was erected. It was a plain wooden building on the south side of the river on the corner of Third street and Collins avenue. After Fr. Ten Broeck, came Rev. Fr. Wolseley, a near relative of the famous British General of the same name. He was here one year and during his time the parish entered the new church. Then came Rev. Fr. Gibson of Green Bay who conducted services for two and a half years. The first resident priest was Rev. William Dafter. He remained here nine years and struggling against great odds, the church made splendid progress. Besides his work here Dr. Dafter was missionary to the people of Suamico, Peshtigo, Marinette and Menominee. Rev. Fr. Hopkins was the first to devote his entire time to this mission. He was here from 1886 to 1894. No words can convey any idea of the greatness of his work. The unselfishness, the hard toil, the unfailing love and sympathy to all, of this devoted priest made a deep impression which remains to this day. Rev. Fr. Mead came next and while he was here the old Methodist place of worship was purchased and is now the main part of the guild hall. Rev. Fr. Lamb followed and did most effective work with the children and in the development of music of the Mass. Then came Rev. Fr. Duffy 1899-1901. The work of this priest was particularly effective in winning men. Under him the work of erecting the present beautiful stone church on the north side of the river was done. Rev. Fr. McNeil accepted the work after Fr. Duffy resigned, but sickness prevented his remaining more than a few weeks and then Rev. Fr. Barrett came, 1902-1904. He is remembered for his strong work with the children of the parish. Rev. Fr. Sanborn followed, 1905-1908, and did splendid work in eliminating a large part of the Church debt and in purchasing a vicarage. He also instituted the daily Mass and Reserved Sacrament. He resigned to become Canon of the Cathedral at Fond du Lac. Rev. Fr. Keeler was here one year. Rev. Fr. Campbell came in 1909 and remained until 1914. He made many friends outside the Church as well as in. 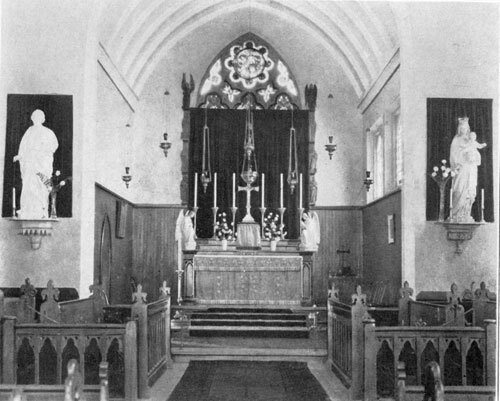 Under him the interior of the church was greatly improved with new altar, pulpit, lectern and pews. $3,000.00 was used for this improvement which was made possible by a generous gift from Bishop Grafton. The church was consecrated on Sept. 27th, 1910, by Bishop Weller. Also under Fr. Campbell, the vicarage was sold and the present one bought in the same block as the church and guild hall. Rev. Fr. Meyers took charge in May, 1915, and remained about two years and was followed in 1916 by Rev. Fr. McMurray who remained about a year and then Rev. Fr. Curtiss came for about a year. He made improvements in the vicarage and won the love of the congregation. Rev. Fr. Sidders came in 1919 and did some very active work. During his time the debt on the vicarage was wiped out, the financial budget was greatly increased and a substantial sum given for missions. About the end of his residence the vicarage was badly damaged by fire. Rev. Fr. Sabin came in 1922, the vicarage was rebuilt, much improved and the work progressed very well. A bad fire did much damage to the church, but the insurance was sufficient to repair it and some improvements were made. A gallery was put in the back of the church for the choir. Rev. Fr. Deis took charge near the end of 1923. His active missionary spirit has very largely increased the interest of the parish, resulting in greatly increased pledges and offerings, and a much larger and more interested Church School. During 1924 the old guild hall was enlarged and made into a very convenient and comfortable building including hall, cloak rooms and toilets, guild rooms, kitchen and stage. The cost of this work was about $8,000.00. The parish certainly appreciates the comfort and convenience of such a place to work in. St. Mark's Church, guild hall and vicarage occupy the whole side of a block on Park avenue. The Church is thought by many to be one of the most beautiful in the state. Oconto is a place of 5000 people and the chief industry is lumbering. During the vacancies St. Mark's has often been served by neighboring priests among them being Rev. Frs. Upjohn, Bartlet, Prescott, Thorn, Penfold, Foster, McCleary, McConnell, Curzon, Ernest, Dr. Schepeler and the Bishop. During the last vacancy the Holy Cross Fathers were in charge and did very effective work. The Church had its origin in Oakfield in a Sunday School started in 1857 in School District No. 10, by Mrs. L. Russell and T. J. Wood. A school teacher named Robert Palmer then began lay-reading and a sermon or two by Rev. Geo. B. Eastman, of Fond du Lac increased the interest. Through the indefatigable efforts of Mrs. L. Russell and Mrs. N. Filbey, funds were collected and a church erected. They were aided in their efforts by Mrs. Robert Kinninment. When the meeting for organizing the Church was held it was found that the gathering lacked one of the number required by law to complete the legal formation, Mrs. L. Russell then crossed a field and asked Wm. Butler to join them, which he did and donated the site for the edifice. The consecration of the building took place in 1861 with Bishop Kemper officiating. The first pastor was Rev. Fr. Turner and the first officers, N. Filbey, Senior Warden, and Robert Palmer, Junior Warden. The congregation was small and found it difficult to support a priest. Services were supplied by priests from nearby towns particularly from Trinity Church, Waupun. Rev. Frs. Wright, Sommerville and Upjohn were among the priests who officiated at Oakfield. Rev. Wm. Armstrong was a resident priest for a number of years and much good work was done during his pastorate. When the railroad came through the village began to grow up some little distance from the church and the building was moved. Later it was found that the lot to which the church has been moved was too low to permit the installation of a furnace and the heating by stoves was unsatisfactory. After a successful Mission conducted by Rev. Frs. Carr and Jenner the number of communicants was considerably increased and the plan of building a new church was proposed. A new stone building was erected, and consecrated, by Bishop Grafton in 1895. Among the resident priests who conducted services in the new church were Rev. Frs. H. Riddell, A. C. Chapman, J. M. Raker, H. B. Sanderson, C. Turquand. At the present time Rev. Samuel Evans of Trinity Church, Waupun, is the Vicar. The present wardens are, T. J. Cragoe and C. H. Cragoe. Not later than 1878 the Rev. Thos. B. Berry, who had a church at Rushford, near Omro, began holding services in a hall over a store in Omro, north of the Fox River. It would seem that after organizing these services he took up his residence in Omro, and to his efforts the misison owes its development. It was during his pastorate that land was obtained and the present church building erected. The land was donated by the late Mrs. Hiram Webster, one of the most loyal and devoted churchwomen of the diocese, and at that time a resident of Omro. Her husband donated the lumber for the Church building. The first service in the present church was held on Christmas Day, 1884. At this time the mission went under the title of St. Paul's, but Bishop Brown in consecrating the edifice on St. Matthew's Day, September 21, 1887, placed it under the patronage of St. John, perhaps taking the name from the church at Rushford, which about this time was closed up. An incomplete list of the clergy is as follows: The Rev. Thos. B. Berry, 1878--? ; Rev. C. T. Susan, 1881--? ; Rev. W. J. C. Agnew, 1887-1888; Rev. E. B. Young, 1894-1897; Rev. Alfred E. Jenner, 1897-1898; Rev. Doane Upjohn, 1899-1905; Rev. Francis Dayton, 1906-1909; Rev. Joseph H. Smyth 1922. About the time of the erection of the present church in 1884, the mission received as a legacy from another church-woman, Mrs. Hale, the gift of a house and lot to be used as a vicarage. It was found advisable later to sell this, and the money constitutes part of the "Omro Fund", held by the Trustees of the Diocese. Omro, when the mission was first organized was a small but prosperous lumber town. Of late years the lumber business has entirely ceased, and the town has diminished considerably in population. It is now composed largely of retired farmers. Houses of the Sisters of the Holy Nativity, Oneida. Formation of Mission: (1) About 1702, in New York State. (2) 1821-23 in Wisconsin. (3) Organized in 1838. (4) First Missionary in Wisconsin, Rev. Eleazer Williams. The Oneidas came to Green Bay and settled near Kaukauna, and, led by the "Lost Dauphin" held services under the trees or in the huts they erected. Mr. Williams had translated parts of the Prayer Book and certain hymns into the Mohawk tongue which he used. Chiefs Skenandoah and Daniel Bread were the most prominent laymen, the former having great gifts of oratory. Churches: In 1825, the first church in Wisconsin, or in the whole of the northwest, was built at Oneida "Hobart Church;" a log building. In 1839, a larger frame church, in which Dr. Wm. Adams and Rev. James Lloyd Breck, founders of Nashotah Seminary were ordained. In 1870, the Oneidas began to quarry and haul stone for the stone church. In 1886 the corner stone was laid, and the church was consecrated in 1887. 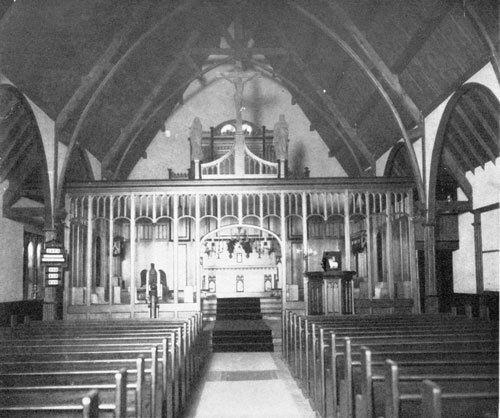 In 1895, the chancel was erected. 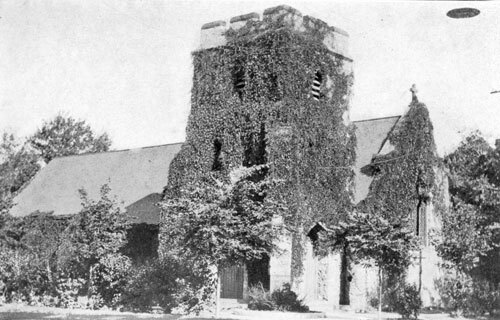 In 1920, the church was struck by lightning and destroyed by the fire. 1921-1922, it was rebuilt on the old foundations and reconsecrated by the Rt. Rev. R. H. Weller, Bishop of Fond du Lac. A hospital was built in 1893 by Rev. Solomon S. Burleson and his son, Rev. H. L. Burleson. The Bishop Grafton Parish House was built in 1906. The Sisters of the Holy Nativity have had a House at Oneida since 1898; the house they built stands next to the Church and is now used as a vicarage. The Sisters occupy the house which for many years had been the home of the missionary. Oneida is unique throughout the American Episcopal Church in maintaining for 100 years, a parochial day school, for fifty children, with two secular teachers. Religious instruction being given at the present time by the Sisters of the Holy Nativity and by the missionary. The Church bell is dedicated to the glory of God in pious memory of John Henry Hobart, Bishop of New York, who appointed the missionary Eleazer Williams. The re-casting of this bell after the fire of 1920 was paid for by the selling of forty acres of land, the property of the mission. List of clergy: Missionaries to the Oneidas in Wisconsin: 1821--. Eleazer Williams, deacon; brought Oneidas to Green Bay; built first church. 1830-1836, Richard Fish Cadle, priest, Rector of Christ Church, Green Bay. 1836-1847, Solomon Davis, priest, organized a parish. 1847-1852, Franklin R. Haff. 1853 to Jan. 25, 1890, Edward A. Goodenough, planned and built the Stone Church 1870-1886; he is buried at Oneida. April, 1891 to Feb. 22, 1897, Solomon S. Burleson, built the chancel; built a hospital; he was buried at Oneida. 1897-1906, F. W. Merrill, built Bishop Grafton Parish House, etc. 1906-1908, A. Parker Curtiss. 1908-1920, William B. Thorn. 1920--, William Watson. Cornelius Hill, an Oneida Indian, last of the old chiefs, was ordained to the priesthood at Oneida in 1903; he had been interpreter for twenty-five years; he is buried in the church yard. Social Service. The Sisters of the Holy Nativity have had charge of the Shelton dispensary for many years and have relieved hundreds of sufferers. They also relieve with clothing, groceries and provisions many needy Indian families. In Grafton Parish House we have basket ball and motion picture equipment, as well as arrangements for out door recreation. Farming community: a creamery and cheese factory are the only industries. The Oneida Indians are being bought out by the white men; many have left and others leaving ere long; only about a thousand now live on the reservation. Very few Oneidas own their own farms unencumbered. Miscellaneous: On our high altar stands a simple wooden cross. It is the old Altar Cross of St. Georges in the East, London, England. During the "Surplice riots" it was thrown into the street by the mob, rescued by Mr. Paget and given to Bishop Brown, and so it came to Oneida and was the only inflammable article saved from the great fire in July, 1900. In former days a barrel-organ supplied the musical accompaniments to the congregational singing, in the church built in 1839. This organ is now in the public museum, Green Bay. In the restored church, in parish house, school rooms and barn we have electric lights, the power being generated by our own plant. Our congregation is entirely Indian, we have no white men in the congregation. The hours of service. Sundays: Holy Communion 7:30 a. m., Church School 10 a. m., Sung Mass with Sermon 11 a. m., Evensong at 7:30 p. m.
Weekdays. Mass on Wednesdays, Fridays and Saturdays in the Chapel of the Sisterhood of the Holy Nativity. On Thursdays and some other days in Hobart Chapel at 9 a. m. Evening Prayer on Holy days and many week days in St. Barnabas Chapel at 7:30 p. m. with a Preparation on Saturday night. We have men and boys in cassocks and cottas as choir-men, servers, etc. On the greater festivals we use incense. As a contribution to the Diocese Jubilee celebration, the following salient facts in the life of Trinity Church, Oshkosh, are set forth by one who looks back upon the thirty years in which he was privileged to minister within its hallowed walls as the happiest period, in point of its human relations, of the forty-nine years of his clerical career. 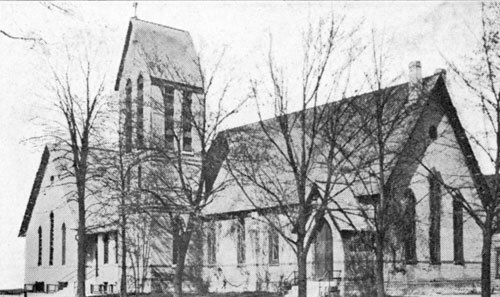 It was in the day of small things for the city of Oshkosh that Trinity Church was born. Early in the year 1850 the Reverend Franklin R. Haff was appointed by Bishop Kemper as missionary to Oshkosh and Neenah. Under that appointment, on the twelfth day of March, 1850, he held in the former city the first service of the Protestant Episcopal Church. Mr. Haff's immediate successor was the Rev. Mr. Sweet of Fond du Lac. Following him, came the Rev. Mr. Callahan during whose period of service a parish was organized under the name of St. Peter's Church. In 1854, under the Rev. David W. Tolford, the old organization of St. Peter's was replaced by a new one carrying the name of Trinity Church. Of this newly constituted parish Mr. Tolford became the first Rector. The first Church edifice, a timber fabric, was built and consecrated in 1857. On New Year's day of 1859 Mr. Tolford resigned the rectorship and was succeeded in April of that year by the Rev. F. R. Haff. After eleven years of prosperous ministry Mr. Haff resigned and was followed by the Rev. Robert N. Parke, D. D., who remained in office for an approximate period of four years, from 1871 to 1875. In 1875 Mr. Haff became Rector a second time, from 1875 to 1885, when he again resigned on account of failing health. His notably long pastorate thus covered a duration of twenty-one harmonious and happy years. 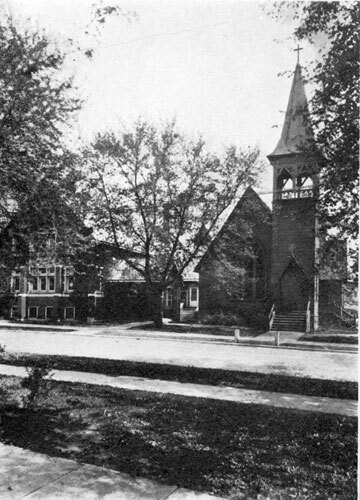 Mr. Haff's first Church services in Oshkosh were held in the old wooden court house, long since removed. For the evening service at that early day the people used to bring tallow candles, holding them in their hands until the responses were all over, when they placed them on the judge's desk "and," says my chronicler, "the minister proceeded with his sermon in a blaze of glory." 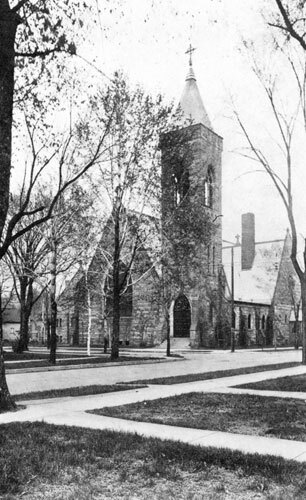 During the second term of Mr. Haff's rectorship and the first few years of that of his successor, there were two other Episcopal Church organizations in the city, Grace Church, on the south side and the chapel of St. Paul in the northern section of the town. After various vicissitudes in the life and history of each, both of these organizations some years ago became extinct. The fourth Rector of Trinity was the Rev. John W. Greenwood, whose incumbency was coterminous with three stressful decades in the world of religious thought, with the result that, after serving the parish from 1885 to 1915 as Rector, he felt compelled because of difficulties of belief intensified by conditions of health, to withdraw from the active exercise of his ministry. Meanwhile, he holds the honorary title of Rector-emeritus. In 1887 the old Church structure was removed and on its site was erected the present edifice of stone. After a short rectorship of the Rev. Jay Scott Budlong in 1916, the sixth and present rector, Rev. Edwin William Todd, entered on his duties the first day of February, 1917, inaugurating an era of marked prosperity and important additions, including a fine new guild hall, to the church property. His eight years of service have won golden opinions. Ad multos annos futuros. The parochial activities of Trinity Church have found expression in many an organization which deserves the tribute of a hearty God-speed. The large boy choir, with its honored master, Mr. W. H. Smith, who has been with it from its inception and has some thirty-five years of service as its leader to his credit, and the Sunday School which from its early days has, in point of numbers, led the van among Episcopal church schools, diocesan and state, both speak for themselves. Not only has the local school from its infancy provided for all its own expenses, but for many years it has regularly donated from its Advent and Lenten collections large sums for missions and other religious and charitable work outside Trinity parish. For well nigh half a century the Confirmation classes have been phenomenally large. During long intervals no other Episcopal Church in Wisconsin has reported a communicant list of equal size to that of Trinity, Oshkosh. And the end is not yet. New fields of social and religious usefulness are opening. Activities along many unwonted lines are multiplying. Conditions radically different from those of yesterday are waiting to be met. Let this already venerable church, equipped with lofty ideals and a fair measure of experience rise to the challenge of its mission in the uplift of humanity and its tomorrow will picturize it for us as a mighty power for good. During Mr. Todd's rectorate two men have gone from Trinity into the ministry. Dr. Lloyd R. Fowzer, who will be a medical missionary in Liberia, Africa; and Rev. Arthur Lichtenberger now located in the diocese of New Jersey. The earliest record of Church services held in Owen bears date Wednesday, Nov. 18th, 1914, when the Rev. Philip H. Linley, the Rector of Christ Church, Eau Claire, conducted Evening Prayer and preached, remaining overnight to celebrate the Holy Communion next morning, services being held in a private home. Regularly thereafter this continued to be the weekly arrangement, and it says much for the missionary zeal and kindliness of the rector of Eau Claire that with the manifold responsibilities of a big parish he should have given of his time so freely to fostering the growth of St. Katherine's Mission. Nor is this the only connection which St. Katherine's has with Christ Church, Eau Claire, for when the time came to build a church in Owen, simultaneously with the building of the present handsome Christ Church, Eau Claire, the old church, with its furnishings, was shipped to Owen, remodelled and re-erected to become the present very handsome St. Katherine's. It is of further interest that in this building our beloved Bishop ministered during his incumbency at Eau Claire, and in it was married. The Rev. Philip Linley (and for a short while his brother, the Rev. Charles H. Linley also) looked after the growing congregation of St. Katherine's until the appointment of the first resident Vicar, the Rev. C. B. N. O. Reader in January, 1919. St. Katherine's Church was set apart for the public worship of Almighty God May 16th, 1916. Its Vicars, with their respective terms of service have been: The Rev. C. B. N. 0. Reader, Jan. 12th, 1919, to Nov. 7th, 1920; The Rev. A. L. du Domaine, Jan. 2nd, 1921 to Sept. 30th, 1922; the Rev. F. W. Sherman Oct. 1st, 1922. The mission records to date list: 136 baptisms, 87 confirmations; 8 marriages and 17 funerals. There are at present some 30 families, with 138 baptized persons and 74 communicants. 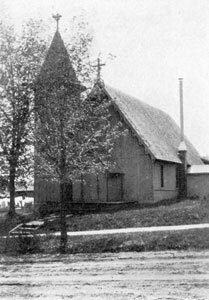 On Jan. 12th, 1925, the Bishop dedicated the new St. Katherine's Community Hall, built to serve the social and recreational needs of the entire community. It is a model building of its kind and is amply justifying the largest hopes of those who made it possible, in that it is in constant use for all sorts of fraternal, social and business gatherings. Services were held occasionally by Rev. Albion H. Ross, Rector of St. Andrew's, Ashland, Wis., during 1906-7, and were resumed by Rev. Harry S. Ruth, Rector of St. Andrew's, Nov. 8, 1915, at the residence of Mrs. O. A. Pierce--6 Communions. In December, 1922, the Rev. Alfred L. du Domaine became Vicar of St. Mary's, Medford, and St. Philip's, Westboro, and was appointed missionary along the Ashland division of the Soo from Marshfield to Ashland, exclusive. Services were held regularly in the ante-room of the Masonic hall. May 1st, 1923, the Rev. Samuel Evans, took charge. The work developed slowly but surely and on the morning of March 16th, 1924, being the Second Sunday in Lent, the Bishop of the Diocese dedicated and blessed a small but complete chapel and parish house combined. The building bought was once the old Soo station, and then a dwelling house, finally almost rebuilt and converted into its present use. It has been completely renovated and changed and a very complete chapel and guild rooms created. The guild worked hard and faithfully and has reduced the debt to a minimum. Services were regularly maintained by Fr. Evans three times per month on Sundays, and on other days occasionally. Fr. Ruth of Ashland, was then placed in charge, April 1, 1925, and has maintained occasional services since that date. The history of St. Paul's Church is a missionary romance. Two brothers from Pennsylvania, H. N. and P. H. Smith, each brought their brides to the little village on the Mullet river, then known by the charming Indian name of Quit-qui-oc, meaning, River's bend. The wife of H. N. Smith was the grand-daughter of Bishop Chase. She had much of the missionary spirit of her illustrious ancestor. She organized a Sunday School in her house, and there the first confirmation class was presented to Bishop Kemper. Later she was ably supported by the wife of P. H. Smith, who with her two daughters were for many years the only members of the family left in the town. She gathered the young people of the parish into her house, organized the choir, and supervised their social activities. She played the organ for over thirty years, and the present organ of beautiful tone, the only pictured window in the church, and the statue of St. Paul over the altar are her gifts. These two staunch church families left their mark on the parish, and for many years its spiritual atmosphere was that of great devotion. The church, built very early in the history of the diocese has been enlarged, but its interior is most quaint and attractive. A good rectory and useful parish hall are of modern date, and the whole property attractive and dignified. Among its rectors have been men of devout lives, and great value to the diocese. The Rev. Mr. Morris, one of the old Tractarians, was an unusual character. He probably was the first to introduce personal books of devotion into the church in these parts. "Steps to the Altar," one of the first fruits of the Oxford movement were brought by him from England, and its teaching on the subject of confession and absolution made quite a stir in those far days. He made a practice of fasting from Maundy Thursday until Easter Day, and his personal contact with the devout souls who were the nucleus of the parish, lasted all their lives. Dr. W. R. Gardner, later president of Nashotah House, was a pioneer in the later development of its life. The use of altar lights and eucharistic vestments began with him. But he had a good foundation to build upon. The history of this parish deserves a larger treatment, but the writer can only give these few impressions, mostly derived from Mrs. P. H. Smith, who did so much to make the parish, and whose holy life meant so much to its spiritual development. In 1892 the realization came to the few Church families living in Rhinelander that we needed our Church, and that if we were to have it we must organize and band together. Bishop Grafton sent the Rev. Fr. Merrill, under whose guidance an organization was perfected, that gave to St. Augustine's Mission the corner-stone on which it has builded. Fr. Merrill came to us at intervals for only a couple of years. Then Antigo shared the Rev. Fr. Burch with us. Up to this time our regular place of meeting had been the Baptist church. Now our services were held oftener and more regularly, so in order not to interfere with the services of the Baptists, we found it necessary to find another place until such time as we could build a church. Lodge rooms over a store were put at our disposal, and here the services were held for the next few years. 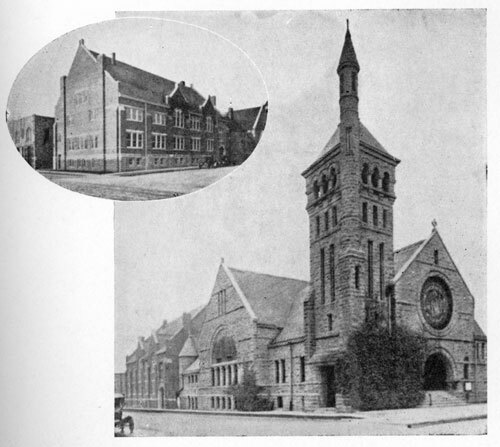 1897 funds were sufficient to buy the present lots on South Pelham street and work on the church was at once begun and Bishop Grafton appointed Rev. Fr. Hitchcock as Vicar. In the years that he was with us, the church was completed. The Rev. George M. Babcock, who came to us as a deacon, followed Fr. Hitchcock in 1901. The following year, on August 28th, the church was consecrated by the Rt. Rev. Reginald H. Weller, D. D., Bishop Coadjutor of Fond du Lac. We then started work on the vicarage which was completed the next year. The Rev. James M. Johnson succeeded Fr. Babcock in Lent of 1906. Our development progressed rapidly during the seven years Fr. Johnson was our priest. The Sisters of the Holy Nativity from Fond du Lac spent one Lent in missionary work among the members of the congregation. And it was at this time that Rev. Russell Vaughan, went to Nashotah and was ordained a deacon. He later was ordained priest by Bishop Weller in our own church here. The debt on the vicarage being cancelled, we set out to have a guild hall which was completed in 1908. Our equipment was now free from debt. We felt ready to sit back and enjoy the things we had accomplished. But we were mistaken, for in the Rev. Campbell Gray, who was with us for the next eight years, we found we had a priest, who proved to us that our spiritual goal was far from being reached. We still claim Fr. Gray as our own for he was with us longer than he had been in any other parish. And it is with just pride that we hail him today as Bishop of Northern Indiana. The Rev. Roy W. Mason became Vicar in the Spring of 1922. During the last two years all of our church property has been improved: the vicarage, first, for Rev. Fr. Mason brought Mrs. Mason to us, a bride. Then the church itself was renovated and changed for our growing requirements. Lastly the guild hall was made into a modern community house. In the basement is the chapel with a seating capacity of forty. The outstanding feature of our plant is the Donaldson memorial room equipped by Mrs. Donaldson in memory of her husband, Carl Howe Donaldson. This room is most attractive with its large reading table with reading lamp and magazines, its many easy chairs, charming pictures and its billiard and pool tables. Our Church organizations are the usual ones. The Brotherhood of St. Andrew is the only chapter in the Diocese. We have a Junior League Society composed of business girls. The Boy Scouts with sixty members, the only troop in town, as well as the Boys' Cadet Corps with twenty-five members. A group of Campfire Girls numbering about forty, and the younger girls, the Blue Birds, are organized and meet regularly. So the guild hall is filling a large place for the whole community as well as being indispensable for the activities of our own organizations. During this last winter an Oratorio Society has been organized in Rhinelander. This society has been sponsored by a goodly number of our Church women, who act as patronesses and who assume the responsibility of any deficit. The practices, for the three oratorios worked up each year, are held in the church and one oratorio each year is given in the church. Ripon, Wis., Monday, Feb. 13, 1860. This day I arrived here to take up my abode, and begin the labour of founding a parish. I believe I am the first resident Church clergyman in this field. I have been informed, that services have been held occasionally by different clergymen for quite a while back. Friday, June 8, 1860. This has been a day long waited for, and prayed for by me, a day long to be remembered with gratitude to Almighty God, that He has permitted me to see it, and rejoice over it with joy unspeakable. The ceremony of laying the corner stone of Grace Church was celebrated Bishop Kemper, officiating. There were present of the clergy, the Reverends J. P. T. Ingraham, Rector of St. James, Milwaukee; F. H. Haff, Trinity, Oshkosh; and G. R. Bartlett, Marquette, Wis. The Rev. Mr. Ingraham gave the address, and most excellent it was in every particular. In the afternoon the Bishop preached at the Hall and confirmed twenty-two persons. Ripon, Monday, Jan. 23, 1861. Praise the Lord O my soul! The new church was this day consecrated to the service and worship of Almighty God, Father, Son, and Holy Ghost. The services were very interesting, and the attendance upon them very numerous, by Church people of this place, Fond du Lac, Oshkosh, Berlin and Rosendale. There were present besides our good Bishop Kemper, Revs. Dr. Ashley of St. Paul's, Milwaukee; Keen of St. John's, Milwaukee; Eastman of S. Paul's, Fond du Lac; Beers of Trinity, Janesville; Bartlett of Trinity, Marquette; Haff of Trinity, Oshkosh; Edmunds of S. Stephen's, Menasha; Dr. DeKoven of Racine College. Dr. DeKoven preached the consecration sermon, taking his text from II Cor. 11-18. The sermon was delivered without notes, and one of the best I ever heard. After the sermon, the Holy Communion was administered to about seventy-five persons, including the clergy. There was an afternoon service and sermon; the sermon preached by the Rev. H. W. Beers; the text Rom. 11:7, and a very noble sermon it was, well seasoned with the "faith once delivered to the Saints." Such preaching as we have heard today, makes me fear that I have mistaken my calling, Miserere Domine. You remember we held our first service in the Baptist Meeting House." The parish school built on a lot bought of Mr. Robinson, was completed in 1864, at a cost of $1,807.12. At their annual meeting in 1865, the vestry acknowledged the gift of the present pipe organ from the Marshall family. At Easter of that year Mr. Octavius Marshall, presented the Church a cross and a pair of candlesticks which the Rector placed on the altar. July 1, 1865, Dr. Durlin resigned the parish. From that time till the following Whitsun-Day, the Rev. G. A. Whitney, a deacon, was in charge. The records do not show any provision for the Holy Eucharist in that time. In this year the vestry voted to change the name of the Parish to S. Peter's. In the spring of 1866 a rectory was begun, and completed at Christmas at a cost of $1975. In May 1866 the Rev. E. Folsom Baker became Rector of the parish. 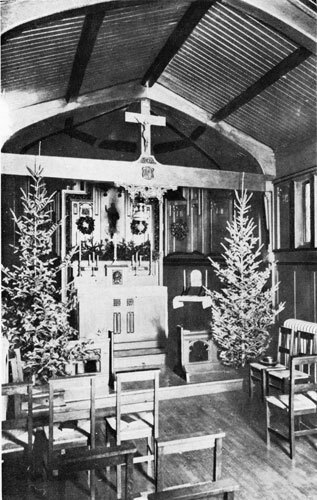 Christmas of that year the vestry replaced the original altar by "one of proper form," and Mr. Octavius and Miss Jane Marshall presented "a crimson embroidered altar cloth, two metal flower vases, and a metal book rest. In April 1868, Mr. Baker resigned. Trinity Sunday, May 23, 1868, the Rev. Jubal Hodges entered upon the rectorship "With a celebration of the Holy Eucharist, thirty communicating." July 5,1869, Mr. Hodges resigned; May 15, 1870, the Rev. Martin V. Averill became Rector, resigning the cure Dec. 19, 1872. Advent Sunday, Dec. 7, 1873, the Rev. F. Durlin again became Rector. Sept. 8, 1880, steps were taken by the vestry looking toward the erection of a chancel to the church. Dr. Durlin resigned the parish Feb. 2, 1883. In accepting his resignation the vestry wrote him. "This is no common relationship which is now being severed. Through all these years and former years, you have been more a father than a rector to the people, a father whom we had hoped to retain with us until he was summoned to his last home. We have accepted your resignation because we know it must be accepted." March 8, 1883, Rev. O. S. Prescott became Rector. All Saints' Day, 1886, Father Prescott resigned. March 3, 1887, Rev. H. H. Barber accepted rectorship of the parish. March 22, 1890, Rev. Mr. Barber resigned the parish. June 9, 1890, Rev. John A. Carr elected Rector. Dec. 28, 1893, Rev. J. A. Carr resigned the parish. April 26, 1894, Rev. C. H. Hayden elected Rector. April 23, 1898, Rev. Mr. Hayden resigned the parish. Jan. 24, 1899, Rev. A. Parker Curtiss elected Rector. He entered upon his duties Sunday, April 30. In 1901 the present Rectory was erected. March 1, 1906, Father Curtiss was succeeded by Rev. Arthur C. Chapman. Rev. Karl L. Tiedemann became Rector in 1921. An enthusiastic layman started the work which led to the establishment of the Church's mission at Shawano. Mr. John David Kast, a Waupaca Churchman, settled in the town about 1875. On Sunday afternoons he gathered children together at his own house and taught them the elements of his religion. The first entry in the service record is full of interest: "The Rt. Rev. J. H. Hobart Brown, Bishop of the Diocese, accompanied by the Rev. Geo. H. Whitney, held the first services, before the full organization of the mission, on Sunday, July 30th, 1876. Morning service was held at the house of J. D. Kast, one person was confirmed and the Holy Communion was administered, nine persons receiving. In the afternoon, service was held at the public school house where a large congregation assembled. The Bishop preached and baptized five children. A Sunday School was opened on the following Sunday. J. D. Kast, superintendent." Very soon "Kast's Sunday School" became a thriving and popular institution with a roll of one hundred students and ten teachers. In these early days of the mission baptisms were a great feature and a proof of the aggressiveness of such faithful lay-people as Mr. and Mrs. Kast, Mr. and Mrs. Chris Hill, Mr. and Mrs. Wm. Charnley, John Loan and Mr. and Mrs. Noah Wright. Of these honored pioneer churchfolk, only Mrs. Wright remains in the town. The home of Mr. and Mrs. Wright was for many years the hospitable headquarters of the visiting clergy. Shawano is a lumber town with allied lumber industries and has suffered from the fluctuations common to that type of industry. The Church's vigor has fluctuated with that of the town and the loss of support by many removals, together with the shortage of priests, have provided a chequered history for the mission. The Church in Shawano has never lacked the faithful few to love and promote its work and interest. For some years services were held wherever a hall could be obtained, settling down to a rented hall over a store. This hall was dignified by the new name of St. John's Hall and fitted for worship as far as possible. The need of a Church building was evident and the desire grew without much material support until 1888. This period opens a new era for the mission and marks the beginning of the regular visits of the Rev. L. D. Hopkins, then Vicar of Oconto, whose faith and leadership placed the mission on a more stable basis. His oversight of the mission spread from April, 1888, to August, 1891. Plans for the building of a church were propagated by Bishop Grafton, Lawyer Dickinson of Shawano, and Fr. Hopkins. The building fund was started, and a reference to it and to other records shows that Fr. Hopkins turned practically all his receipts from the mission back into this fund. Bishop Grafton showed great interest in all the planning and aided materially in the building expense. In 1892 Mrs. George C. Smalley, a churchwoman, deeded to the Church a piece of land almost covered with growing pines. Building started immediately and the stone foundations were laid in this setting of pine trees. 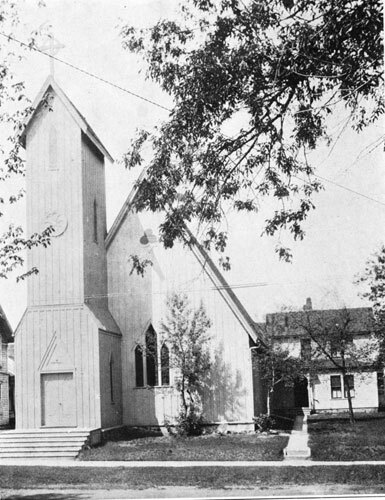 In 1895 the Church was built, the white frame Church now standing. There is a spacious sanctuary and choir and the nave has centre and side aisles. Archdeacon Schepeler was in charge during the period of the actual building. The list of clergy from then on includes: Rev. Frs. Lamb and Foster and the Rev. H. S. Dawson, a deacon. In 1905 the Rev. Doane Upjohn, priest, took charge, the first of a line of resident clergy. He was followed in 1908 by the Rev. E. N. Webber and the Rev. R. L. Knox. In 1911 the Rev. W. C. Bimson, a deacon, came into residence, being ordained priest the year following by Bishop Weller in the mission church. During Fr. Bimson's charge, a splendid vicarage was built on the Church property. Bishop Grafton also assisted considerably in financing this project. The Rev. A. E. Johnstone took charge from June, 1915 to April, 1916, followed by the Rev. R. H. Baldwin, a deacon, for a few months. 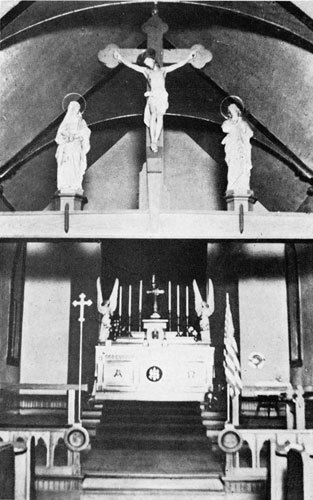 The mission was closed from 1916, except for occasional services, until June, 1920, when it was opened by the Rev. F. W. Barrett, who stayed until June, 1921. A new oak pulpit was placed in the church during Fr. Barrett's year at the Mission. Since 1921 the mission has been in charge of the Rev. Francis W. G. Parker, the present Vicar. During the four years past the property has been improved by the addition of cement sidewalks and street paving, and the church and vicarage repainted. The church interior has been largely refurnished. A stone font has been set up. The sanctuary has been beautified by the resetting of the high altar within a background of oak panelling, with new gradines and tabernacle. The old wooden altar cross and candlesticks have been replaced by gilt crucifix and a full set of tall metal candlesticks, which, with a new sanctuary gong, represent memorials of members of the congregation to departed friends. 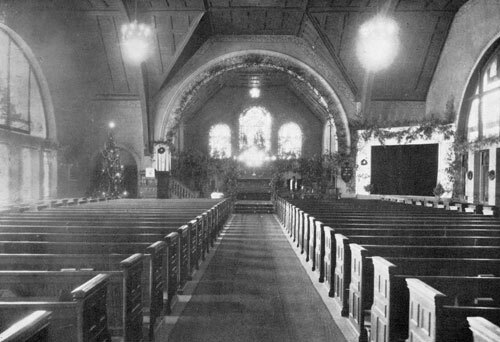 More choir seating provides for the vested choir, which was introduced in the Fall of 1921. Perhaps the happiest improvement of recent years has been the addition of the little Blessed Sacrament chapel, with its altar and tabernacle, all fittingly furnished, the old brass vases are the gift of St. Nicholas Church, Boston, England, and the small sanctuary lamp comes from Florence, Italy. This chapel, with its proper heating and lighting arrangements, has made possible the daily Mass, and above all, has rendered practical the joy of continuous reservation of the Holy Sacrament. Church people should so arrange their week-end traveling in this neighborhood that they may fulfil their Sunday duty by sharing in our worship. The mission welcomes you. So far as can be learned, the first services of the Church were held in Sheboygan in 1845, by the Rev. S. K. Miller, then in deacon's Orders, who visited this place and held services on one Sunday, and it was "his representations of the good congregations he had, and of the strong desire among the people to have a minister" that led Bishop Kemper to send the Rev. William Homman to establish the Church here. Mr. Homman arrived in Sheboygan on the 31st day of August, 1845, and held service on that day in a building used for school purposes, as well as for "all religious and literary meetings." In the autumn of the same year a room was secured over the store of Carrington & Brown on Eighth street, a few doors north of Jefferson avenue, and fitted up and used exclusively for the services of the Church. Mr. Homman remained in Sheboygan for eight months, during which time he maintained regular services here, besides officiating occasionally at the "Dye and Gibbs settlements, some ten miles south and west of Sheboygan," and also at Fond du Lac, Taycheedah and Sheboygan Falls. After Mr. Homman's departure in April, 1846, there were no regular services until February, 1847, when the Rev. 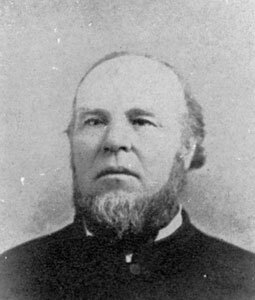 L. W. Davis, then in deacon's Orders, took charge of the mission. 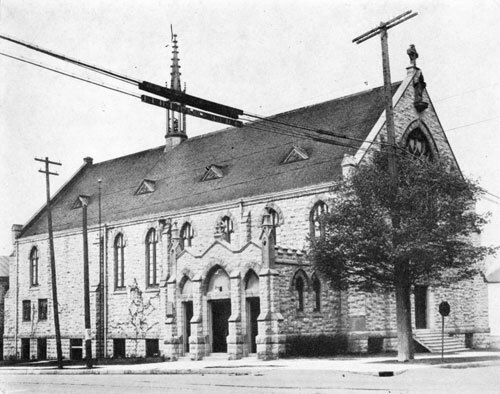 During the summer and fall of the same year the parish was organized and a frame church building was erected on the site of the present church. The lot was donated by Daniel Whitney of Green Bay, and the building, including the furnishings, cost six hundred dollars. The edifice was used for the first time on Christmas day, 1847, and was consecrated by Bishop Kemper on February 12, 1848. Father Davis remained in charge until the summer of 1851, when he removed to the diocese of Mississippi. He returned and resumed the care of the parish in 1852. After Father Davis' resignation in 1854, the parish was deprived of regular ministrations until June, 1856, when the Rev. John B. Pradt became Rector. During Father Pradt's rectorship the Church building was enlarged, affording about fifty additional sittings, and a vestibule was built. In addition to his work in Sheboygan, Father Pradt held monthly services at Plymouth, and as the result of his labors a parish was organized there in 1857, and a church building erected the following year. He remained in charge of the Sheboygan parish until July, 1858, when he resigned in order to devote himself to missionary work, with headquarters at Plymouth. 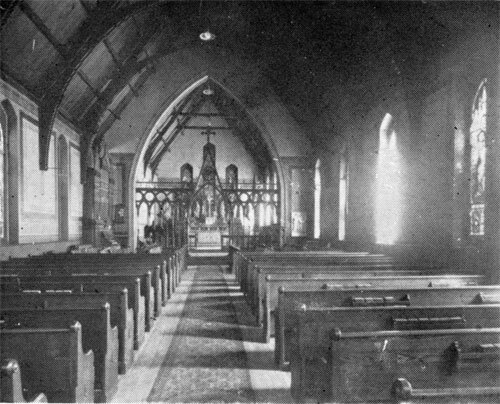 Father Pradt, however, supplied the Sheboygan parish with a service every Sunday evening until the spring of 1859. In July of that year the Rev. James W. Coe, Rector of Trinity Church, Janesville, Wis., became rector and continued until 1861, when he was succeeded by the Rev. A. B. Peabody, who in turn was succeeded in 1862 by the Rev. Robert Walter Blow, a young man not long graduated from the seminary at Nashotah. Lack of space forbids the telling in any adequate way of Father Blow's work. Volumes could be filled and much remain untold. Twenty-eight years of patient, untiring service, and all that he had of worldly goods, were given to the Church he loved so well. But better than these was the kindly interest and' love he bestowed upon every one, whether a member of the parish or not. His whole life was the exemplification of our blessed Lord's command to "love thy neighbor as thyself," and in return he was firmly fixed in the affections of the entire community. The present church, which was built in 1871, at a cost of $7,752, most of which was gathered by Father Blow's own efforts, stands as a monument to his piety, zeal and self-denial. Father Blow died on February 12, 1890, and was succeeded by the Rev. F. R. Sanford, who remained less than two years, being followed by the Rev. F. W. Merrill, who in turn was succeeded by the Rev. L. D. Hopkins, in 1894. Father Hopkins remained until 1901, and during his rectorship the parish attained the highest degree of prosperity in its history. He resigned, leaving a communicant list of 220, with church and rectory renovated and free from debt. The Rev. E. M. Frank became rector in 1901, but retired after eighteen months, being succeeded by the Rev. F. M. Ray. Father Ray resigned in 1905, and the vestry extended a call to the Rev. W. A. Grier. During Father Grier's rectorship the rectory, the brick dwelling at 629 Ontario avenue, which had been erected by Father Blow for his own home and had been left by him at his death to the Church, was traded for the property adjoining the church on the east, and the interior of the church was renovated for the second time. In October, 1907, Father Grier accepted a call to Philadelphia, and on the first of the following month the Rev. J. Boyd Coxe assumed the charge of the parish. Shortly after he arrived work was commenced on the rebuilding of the rectory, which was accomplished at a cost of something over $2000. After two years Father Coxe received a call to St. Louis, Mo., and after a short interval, during which the parish was supplied by Father Smith, Father Hopkins and Bishop Weller, the Rev. A. Parker Curtiss was elected Rector and assumed charge of the parish on December 5th, 1909. 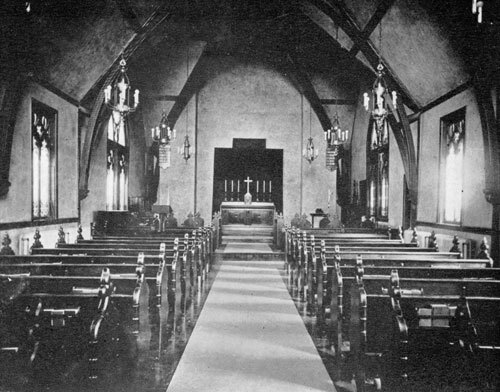 During Father Curtiss' incumbency many improvements were made to the material fabric of the church, including a beautiful oak Communion rail and a very handsome tile-floor in the chancel. In 1911 a parish hall was built at a cost of over $8,000, in memory of Father Blow. As a consequence of the increased accommodation, two very nourishing organizations were added to the activities of the parish, the Boy Scouts and the Girls' Friendly Society. In 1915, Father Curtiss was invited to take charge of the preparatory department of Nashotah Theological Seminary. The Rev. B. T. Jenkins succeeded him in October, 1915. In May 1920, he withdrew, and was succeeded by the Rev. G. M. Babcock in October, 1920. In May, 1923 he was succeeded by the Rev. A. Parker Curtiss, who is still in charge of the parish. Plans are on foot for the rebuilding of the rectory. At the solicitation of two or three prominent gentlemen of Sheboygan Falls the Rector of Grace Church, Sheboygan, the Rev. Robert W. Blow commenced holding services in the Free Hall the First Sunday after Easter, 1864. In the Autumn of 1864 the Rev. Fr. Morris of Plymouth helped with services until the Rev. Sidney Woodford came as a missionary. Bishop Kemper laid the corner stone of the church June 8th, 1869. Mr. H. Cofrin was the designer and builder of the church. The first regular vicar was the Rev. N. D. Stanley who came as a Deacon Nov. 15, 1885 and was ordained priest the next March. Fr. Stanley made the Eucharist the chief service of the day and on the First Sunday in Advent colored Mass Vestments were used for the first time. The vicarage, chapel and two other buildings were added to the church property. The Church building does not stand in the original location because the river washed out most the land and the church was moved to Buffalo street. In 1911 at Fr. Stanley's twenty-fifth anniversary the mortgage on the church was burned and a fund was started for the building of a new church. Fr. Stanley had the Rev. Carlton Turquand as a Curate from 1916 until 1918 until he left for Washington, D. C. The Rev. Martin B. Kilpach became Curate until 1920 when he became Vicar of St. Peter's Church and the Rev. N. D. Stanley removed to Fond du Lac, after a rectorate of thirty-five years, beloved by all his people. Fr. Kilpach's life was short and he died October 28, 1921. The Rev. Baxter Norris came Nov. 15, 1921, and after one year's work left for the Diocese of Long Island. The Rev. Herbert S. Stanton became vicar on Nov. 15, 1922, just thirty-seven years to the day that Fr. Stanley entered in the work. St. Peter's Church has grown in every way and God willing the new St. Peter's Church will be built this year. The parish of the Church of the Intercession was organized on the sixth day of December, 1852. On that day the Rt. Rev. Jackson Kemper visited the parish, conducted services, administered Holy Communion and baptized and confirmed seven people. Through the efforts of General A. G. Ellis (then receiver of the U. S. Land Office) the first church was erected at the northeast corner of Clark and Church streets. The first service in the new church was held on August 14th, 1855, the Reverend Stephen Millet and the Rev. Thomas Greene officiating. Father Greene became the first rector of the parish on November 13th, 1853. The church was consecrated on Dec. 11th, 1853, and for five years Father Greene was retained as rector. He was succeeded by Rev. Joseph Adderley, Rev. Stephen Millet, Rev. J. B. Pedlupi, Rev. A. P. Crouch, Rev. William Charles, Rev. W. Hommann and Rev. Chas. Hindley. Early in 1870 the Rev. Jerome Davenport became rector. In Jan., 1875, the Rev. Ebenezer Thompson became rector, the number of communicants having by that time increased to 182. The Rt. Rev. John Henry Hobart Brown, first bishop of Fond du Lac made his first episcopal visitation to the parish during May, 1876. During Father Thompson's rectorship transepts were added to the church and a parochial school was organized. He was succeeded by the Rev. Wm. Henry Watts. During his rectorship, General Ellis, one of the most distinguished citizens and member of the parish died, having served as senior Warden since its beginning. It was during Fr. Watts' rectorship that Bishop Brown died and Bishop Grafton made his first visit to the parish. It was at the close of Fr. Watts' rectorship that our present beloved Bishop was chosen rector. During the first year a rectory was built on the site of the old one at the cost of $3,000. Father Weller's rectorship was marked by great and progressive activity. Dependent missions were organized, Sisters were added to the staff, a boy choir was organized, the order of services were changed, St. Agnes' Guild was founded (one of the most prominent guilds in the parish at the present time), together with a Girls Friendly Society and other organizations. One of the most notable achievements of Father Weller's rectorship was the building of the present church edifice. 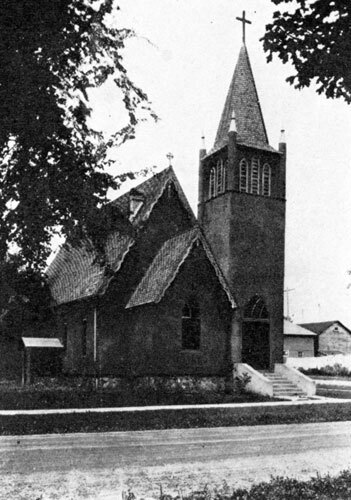 The new church built of grey stone together with a small parish house and chapel was completed in January, 1894, at the cost of approximately $35,000. It was through the generosity of Mrs. A. E. Bosworth and her son that the erection of the present church was made possible. At this time the services of the Church were much improved, Masses were said regularly, incense was introduced for the first time and the communicants were increased. Father Weller was elected Bishop Coadjutor of Fond du Lac. His acceptance of this office terminated his rectorship at Stevens Point. He had during that time increased the Communicant list of the parish to approximately 500 people. Father Weller was succeeded by the Rev. A. Geo. Jenner. During Father Jenner's rectorship a debt of $6,000 was paid and on Saturday, December 6th, 1902, the church was consecrated. The fiftieth anniversary of the founding of the parish. Father Jenner was succeeded by the Rev. Martin Ray in the Spring of 1905. His rectorship was marked by great activity and accomplishment. Probably the largest Confirmation class in the history of the parish was presented during this time. He was succeeded by the Rev. Edgar Morris Thompson on January, 1908. Father Thompson organized the Knights of St. Paul and greatly extended the work of the church among the young people. He was succeeded by the Rev. E. Croft Gear on December 1st, 1912. During Father Gear's rectorship the rectory was greatly improved, Boy Scouts were organized, women's guilds became more active and after a disastrous fire the new parish house was erected at the cost of $18,000. Father Gear terminated his rectorship in January, 1924, and was succeeded by the present rector, the Rev. Carl William Bothe, B. D., called by the vestry and unanimous desire of the congregation from his position as assistant priest of the Church of St. Mary the Virgin, New York City. Tomahawk is pleasantly situated on a wooded plateau at the junction of the Wisconsin, Tomahawk, and Somo rivers. It is served by the C, M. & St. P. Ry., the Soo Line (Bradley station), and the M., T. & W. R. R. Originally a boom lumber town, it is now principally known for its paper mills, fishing grounds, and superb natural park. State trunk highways 10, I 14, and 91 run through or near town. The population is 3200. The sale of lots began in 1887. Church services were held intermittently by neighboring priests, and in the summer months by seminarians from Nashotah House, from the early nineties onward. In 1895 the diocese acquired 216 feet of frontage near the center of town; and in the next year the present Church building, still one of the largest structures in town, was erected. In 1899 Bishop Grafton ordained the Revd. C. Trask Lewis to the priesthood at a solemn high Mass, the first solemn service ever held at St. Barnabas' Church. Father Lewis was succeeded in 1900 by the Revd. Frederick Waldo Barker, who is more fully commemorated under the Merrill parish. His was the longest pastorate. Other priests who served the Tomahawk congregation at various times are the Revd. Fathers Carr, Floyd Keeler, Henry Gibbs, Webber, H. F. Arends, Jay Russell Vaughan, Pflaum, and Harry S. Ruth. The Revd. Father Joseph, O. S. F., the present incumbent, first took charge in 1913. Since January, 1925, he has been assisted by the Revd. J. Arthur Swinson, deacon, as resident Curate. A former parishioner, Mrs. May Kelly (R. I. P.), has given St. Barnabas' Church a sum sufficient to erect a vicarage and make other improvements in the property. March 4th, 1856, Bishop Kemper visited Waupaca and performed the double marriage ceremony of the following: E. L. Brown and Mary Parish of Vermont; George L. Lord and Hannah Parish of Vermont, and Mr. E. L. Brown who is still living aged 95 comes to Church for his communions, and is perhaps the oldest communicant in the Diocese. At least he is the oldest who comes out to Church. This double marriage ceremony marked the beginning of the Church's work in Waupaca. The Rev. M. E. Sorenson was sent immediately as the first missionary. Was missionary from 1856 till 1870. Organized as a mission in 1856. Services held in houses and rented buildings, Lord's Hall and Court House. Church built in 1857, Destroyed by fire in 1903. Prominent laymen in the early days were Richard Lea, Winthrop Lord, George L. Lord, Charles L. Wright, Paul S. Woodnorth, Thomas Pipe, Charles Chesley, James Chesley, P. H. Chesley, E. L. Brown. Rectors as far as can be ascertained: Rev. M. F. Sorenson, 1856 to 1870; Rev. E. Slade, 1871 to 1872; Rev. W. C. Armstrong, Rev. J. A. McGlone, Rev. T. Tucker, George Gibson, Rev. Benj. T. Trego, Rev. H. L. Burleson, Rev. A. G. Harrison, Rev. L. D. Hopkins, Rev. George Hirst, Rev. J. Barry Ryan, Frederick G. Deis, Arthur G. Wilson, E. A. W. Hanington Wilson, George J. Sturgis, Charles D. Fairman, Jay Gould Secord, A. Worger Slade, no record of dates for these. Former church built during rectorship of the first missionary the Rev. M. F. Sorenson in 1856. Destroyed by fire in 1903. Present church built in 1904 during rectorship of the Rev. George Hirst, Mr. A. G. Nelson, Senior Warden, now Senior Warden Emeritus was great help in this. Former rectory built during rectorship of the Rev. W. C. Armstrong. Later sold. Present rectory built during the rectorship of the Rev. H. L. Burleson. Lot on which present church stands given by Mr. E. L. Brown. Deaconess Mary Truesdell was set apart as a Deaconess on Ascension Day, 1918, by Bishop Rhinelander in Philadelphia. This was during the rectorship of Fr. Fairman. Daughter of Mrs. C. H. Truesdell who is daughter of Mr. E. L. Brown. One former Rector the Rev. H. L. Burleson is now Bishop of South Dakota. Waupaca is the county seat of Waupaca county. Population 3000. No factories. Supported by farming community trade. Is a great summer resort on the Chain of Lakes. Good summer congregations. A growing community. Present Rector is the Rev. Alfred I. du Domaine. Been here since May 1st, 1923. Have fine vested choir composed mostly of young high school pupils. Is a credit to the city. Finances and everything in fine shape and moving forward. Future is bright. Present Vestry. Mr. A. G. Nelson, Senior Warden Emeritus. Mr. Wallace Lord, Senior Warden (son of Geo. L. Lord married in 1856 by Bishop Kemper); Mr. Charles Hoffman, Junior Warden; Mr. Lloyd Smith, Mr. George Skinner, Mr. Wyllis Holmes, Mr. E. W. Nelson, Mr. Frank Housman, Clerk and Treasurer. During the present rectorship a new heating plant has been put in the church. Greatly beautified the interior of the church. Much needed improvements made in the fabric of the church and rectory. Rector's salary increased. Increased income of parish fifty per cent. St. Mark's doing its part for outside work also. Two fine hard working guilds, St. Mark's and St. Agnes. Choir club composed of twenty-six young people. Rector trains fine choir himself. Miss Anne Suhs exceptionally fine organist. Eighty-six communicants. The Church came to Wausau with the early settlers. There were a few scattered families, a few stores and several saw mills. The first services were held at Forest House, an inn owned by Mr. Charles Single, father of Mrs. C. F. Dunbar who is still an active communicant of the parish. The Rev. Thomas Green, living at Stevens Point officiated, driving through winter storms and summer heat over roads decidedly different from our paved roads of today. St. John's Church was organized as a parish on September 22nd, 1858, by the Rev. Thomas Green, Rector, Thomas Youles and Charles Single, wardens, John C. Clark, Benjamin Single, Burton Millard, Fredrich W. Tyler, Thomas Single, J. A. Farn-ham, Charles Shuter, and William C. Clemson, vestrymen. The articles of incorporation were filed in the office of the clerk of the circuit court of Marathon County, Wis., on November 1st, 1858. In the same year the frame of a church was erected on the site of the present church, which had been deeded to Bishop Kemper of the Diocese of Wisconsin in 1857 by the Hon. W. D. Mclndoe of Wausau. The civil war came on, hard times prevailed. Father Green enlisted in the army and the little wooden church was never completed, and the frame was blown down. Father Green returned to Wausau in 1867 and was elected Rector. In the same year a church was built on the foundation of the old frame. This church was consecrated by Bishop Armitage in 1873. Father Green resigned October 1st, 1873 and was succeeded by the Rev. Philip McKim in 1874 who resigned in 1876, and was followed by the Rev. J. A. Davenport who remained only one year. From September 30th, 1877 to September 18th, 1881, the Rev. Thomas Green was again rector of the parish, resigning on the latter date and being elected as Rector-emeritus. The Rev. William Wright became rector on October 1st, 1881. In the following year the rectory was built and an indebtedness of about $1800.00 incurred for the purpose. In 1886 the church building was repaired and improved at considerable expense. Father Wright resigned in February, 1891, and in July of the same year was succeeded by the Rev. A. G. E. Jenner who was rector until December, 1893. The Rev. John A. Carr became rector on January 7th, 1894. In 1895, the building indebtedness was paid by individual subscriptions, largely through the efforts of the senior warden, Mr. M. B. Atwater. Father Carr resigned on January 31st, 1898, and was succeeded by the Rev. W. J. Cordick who was rector until May 1st, 1903. The Rev. George Hirst was rector from October 24th, 1903 until March 24th. 1904, and he was succeeded by the Rev. E. M. Thompson on May 15th, 1904. During Father Thompson's incumbency the floating debt was fully paid. He resigned in 1908 and was followed by the Rev. Wm. E. Johnson in October of the same year. 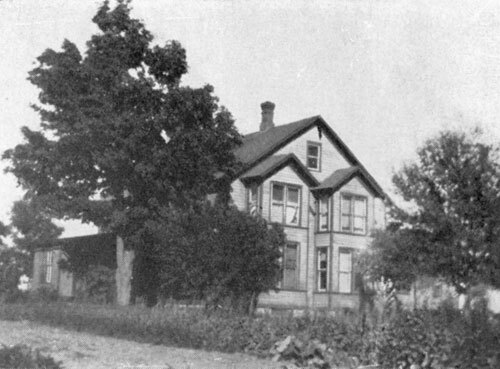 In 1909 through the efforts of Father Johnson, St. John's Hospital Association was organized and out of it grew the present Children's Infirmary of Wausau. During the last year of his rectorship Father Johnson devoted a portion of his time to general missionary work, and the Rev. L. M. Grant who was then in deacon Orders, was chosen his assistant. Upon the resignation of Father Johnson in February, 1912, Mr. Grant took charge of the services until his ordination to the priesthood in September, 1912, when he became Rector of the parish. During this time through the efforts of St. Martha's Guild, a pipe organ costing about $1,800.00 was installed in the church. Father Grant resigned June 1st, 1913, and on September 1st of the same year the Rev. John Lloyd became the Rector of the parish. In the following spring, the parish decided to build a new church of stone, move the old church to the north side of the lot, connect it with the new church and convert it into a parish house. A building committee of five, composed of D. C. Everest, John Lull, P. O. Means, L. A. Pradt and M. B. Rosenberry, was appointed to carry out that purpose. The canvass for the necessary subscriptions was made during the summer of 1914, and pledges amounting to about $25,000.00 were made. Messrs. Chromaster, Speer and Harvey Swarthout of Wausau, were selected as the architects for the building and on September 11th, 1914, the contract for the construction work was made with the Herman Construction Co., of Antigo, Wis. The corner stone of the new church was laid by the Ven. E. Croft Gear, Archdeacon of Stevens Point, acting for Bishop Weller, in October 19th, 1914. The first services were held in the new church in March, 1915, and on Wednesday, May 12th, 1915, the church was consecrated by Bishop Weller. The Rev. John Lloyd resigned October 31st, 1917. The Rev. Cuthbert F. Hinton became rector of the parish on November 1st, 1917, and under his guidance the parish continued to grow and prosper. Father Hinton resigned on October 31st, 1920. On April 1st, 1921, the Rev. William C. Way became rector and occupies that position at the present time. At the annual parish meeting in January, 1922, it was decided to build a new rectory of stone to the height of the second floor, and from there up to use hollow tiles covered with cement. The guild hall was also to be enlarged by an addition to the west end of 12.4 by 39 feet. A building committee composed of D. C. Everest, L. A. Pradt and Dr. Joseph F. Smith was appointed. Messrs. Oppenhamer and Obel of Wausau were chosen as the architects, and the Otrich and Shropshire Co. of Stevens Point were given the contract for construction. The cost of the rectory and the addition to the guild hall was about $27,000.00. Pledges amounting to $16,000.00 were made by members of the parish, and $3,000.00 by the faithful members of St. Martha's Guild. The rector and his family moved into the new rectory in November, 1922. In March, 1923, the church was enriched and beautified by the installation of four memorial windows, given in memory of Charles and Elizabeth Single, Robert Parcher, Mrs. Mary Parcher, and Mrs. Josephine Single Baldwin. These windows were made by the Ford, McNutt Co., of Minneapolis. The designs are in accordance with a complete plan for windows for the whole church, by which will be shown events in the life of St. John the Baptist. On Whitsunday, May 20th, 1923, the windows were dedicated by Bishop Weller, and the next afternoon was the benediction of the new rectory by the Bishop. St. John's parish now has a property valued at $105,000, and which is considered as one of the most beautiful Church properties in the State. The present members of the vestry are: Senior Warden, Hon. L. A. Pradt; Junior Warden, Dr. Joseph F. Smith; Vestrymen: Dr. G. G. Anderson, D. C. Everest, George Giffin, John B. Hall, R. E. Puchner, T. H. Ryan, Jas. Silverthorn. The first regular services of the Church were held in this village by the Rev. C. Thorp, deacon in charge, on Sept. 1st, 1867. Regular services have been sustained from that date. On Nov. 10, 1867, Bishop Kemper visited the field and baptized an adult. On Nov. 17, 1867, the envelope system was begun. The 29th of Nov., 1867, the mission was organized under the name of Trinity Church. Mr. S. Chamberlain was appointed Warden, Mr. I. W. Seely, Treasurer, and Mr. C. E. Jennings, Clerk. On January 27th, 1868, Bishop Armitage visited the mission and the first class of five men presented for Confirmation. June 23rd, 1871, the Rev. Robert B. Wolseley was appointed by the Bishop, missionary in charge. On Monday, Sept. 11th, 1871, the Bishop visited the mission, attended by the Revs. M. V. Averill, Wm. Dafter, and D. B. Lyon." Morning service was held at 10 o'clock. After this, a class of nine persons was confirmed and the Holy Eucharist celebrated. In the afternoon the cornerstone of the Church building was laid by the Bishop. Sept. 15, 1872, Rev. R. B. Wolseley officiated for the last time having accepted a call to Franklin, Tenn.
Oct. 15th, 1872, Rev. W. E. Wright removed from Berlin to be missionary at Waupun and Rector of Grace Church, Oakfield. In 1882, Rev. H. C. E. Costelle took charge of the mission. In 1884, Rev. H. Baldwin Dern resigned St. John's Havre de Grace, Md., and accepted the mission of Trinity, Waupun, and Christ Church, Fox Lake, in the Diocese of Milwaukee. In April, 1892, the Rev. George H. S. Somerville, Ph. D., resigned the rectorship of Grace Church, Appleton, and accepted Waupun, and Grace Church, Oakfield. Dr. Somerville resigned and accepted the rectorship of St. John's, Chicago, Nov. 1st, 1918, after a faithful postorate of 26 years. After four other brief vicarships were ended, on April 1st, 1925, the Rev. Samuel Evans, who had been vicar of St. Mary's, Medford, and missionary at four other places along the Ashland division of the Soo, became Vicar of Trinity, Waupun, and St. Mary's, Oakfield. Our Episcopal friends have let the contract for the erection of their new Church building in Centralia (Wisconsin Rapids) to Mr. Decereau, for the sum of $1,500.00. The work is to begin by May 1st, and to be completed by October 1st. We wish them abundant success." Centralia Enterprise (Wisconsin Rapids) March 6th, 1879. Thus do we first read of the beginning of Saint John's Church in Wisconsin Rapids, then called Centralia, Wisconsin, and from that day, now more than forty-six years past until the present day in the Jubilee Year of the Diocese of Fond du Lac, Saint John's Church has been located on the northwest corner of Third Avenue North and McKinley street, in Wisconsin Rapids, the present Church building being the one that was projected and soon afterward completed by the labors of the Resin, MacKinnon, Hoskinson families and Mrs. Hannah Albee, nearly a half-century ago. The present vicarage and guild hall were built during the vicarship of the Reverend C. H. Branscombe, in August, 1897. Additions and improvements have been made in the Church building since its erection, and in 1916 the vicarage was remodeled and enlarged when the Reverend Johannes Rockstroh became the vicar of Saint John's Church. 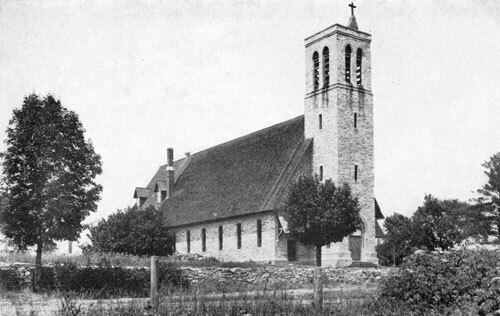 Saint John's Church, became an organized mission in 1882 and was admitted to the Council of the Diocese of Fond du Lac in 1897. No record is available of the names of the first missionaries in Centralia (Wisconsin Rapids) until 1890 when we find the Rev. R. H. Weller, Stevens Point, ministering to St. John's Mission for three years, then the record carries the names of the Rev. Fr. Harper, the Rev. George Shelton, until 1896 when the Rev. C. H. Branscombe, became Vicar for a term of three years. The Rev. James Augustus Baynton was Vicar from 1899 to 1900, and was followed by the Rev. Leopold Kroll, from 1901 to 1902, when the Rev. Fr. Nicholas became Vicar. The Rev. Alexander Corbett was Vicar from October, 1903, until March, 1904, and on May 23rd, 1904, the Rev. Clyde B. Blakeslee began a service of nearly six years as Vicar of Saint John's, leaving Wisconsin Rapids on January 3rd, 1910. The Rev. Charles H. Walters was Vicar of St. John's from Feb. 11, 1910, until June, 1911, and in April, 1912, the Reverend August Christian Fliedner, came to Saint John's for a vicarate of nearly four years, leaving in February, 1916. On June 11, 1916, the Reverend Johannes Rockstroh, began the longest Vicarate in the history of Saint John's Church, serving for over six years, until the 19th of November, 1922. The Rev. Thomas Bellringer was Vicar of St. John's from January 28th, 1923, until May 18th, 1924. On July 1st, 1914, the Reverend Gardner Alpheus MacWhorter, came to Saint John's Church as Vicar and will soon celebrate his first anniversary in that mission. The present organization of Saint John's Church consists of the following: The Reverend Gardner Alpheus MacKinnon, Vicar since July first, 1924; Robert Falkland Agenor MacKinnon, Senior Warden and a member of St. John's Church since its founding; Isaac P. Witter, Junior Warden and a member of the Church for the past quarter of a century; William F. Kellogg, Vestryman, and a member of St. John's Church, as is his wife, Mrs. Johannah L. Kellogg, treasurer, for the past twenty years; Reginald M. MacKinnon, Vestryman and a member of St. John's Church for twenty years; Edward P. Gleason, vestryman and a member of St. John's for thirteen years; Richard M. Gibson, Vestryman, and a member of St. John's for ten years; Mrs. Charlotte Gibson Witter (Mrs. Isaac P. Witter) Organist and Choir director for the past twenty-five years; and Mrs. Mildred MacKinnon Jenkins (Mrs. James Wade Jenkins) President of Saint Katherine's Guild as was her mother before her, a member of St. John's from her birth and baptism. Mr. Elbert King has the distinction of being one of the first sons of St. John's Church having been baptized here thirty-five years ago. Mr. Isaac P. Witter, Junior Warden of St. John's Church holds many important offices in the Diocese of Fond du Lac, being a member of the Finance department of the Council, the Jubilee committee and alternate deputy to General Convention, and a trustee of Grafton Hall.